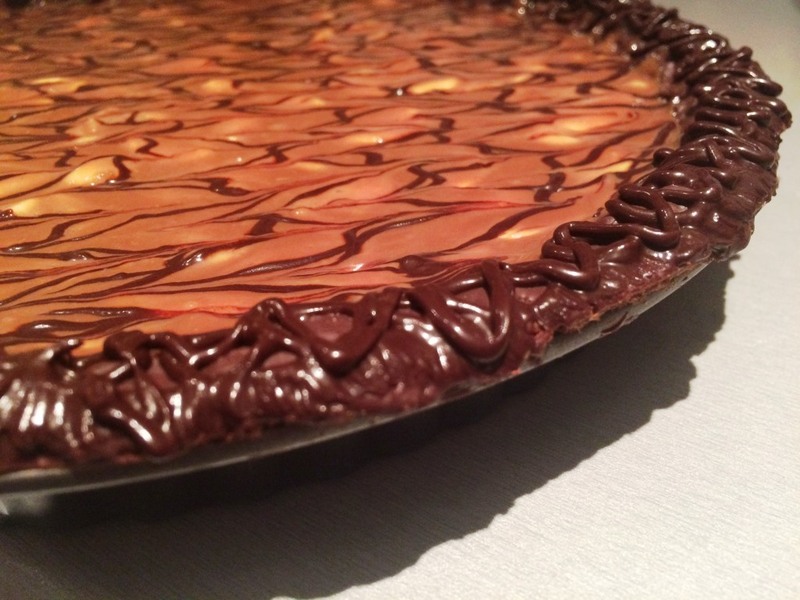 Semi-final week in GBBO so it follows that chocolate week comes to the Great Bloggers Bake Off – how could I resist making something?! 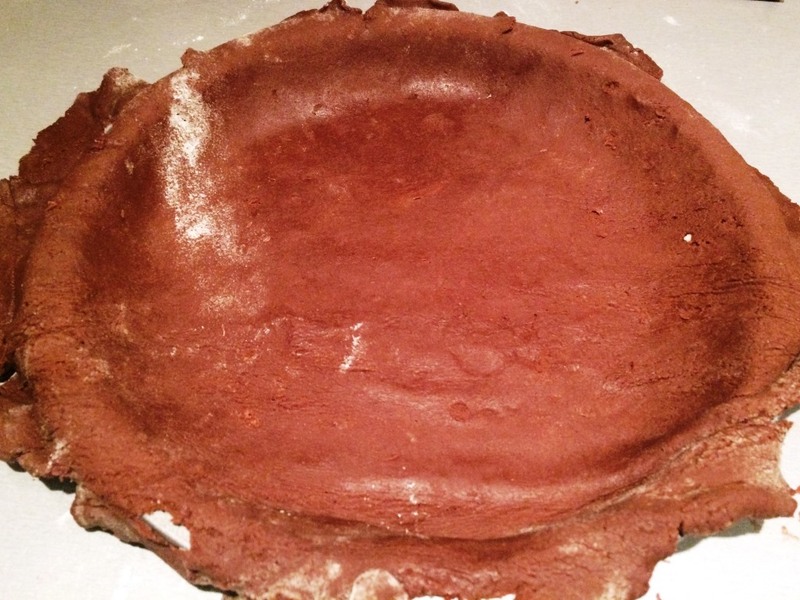 The pastry was an enriched dough, with sugar, cocoa powder and an egg yolk added to the normal butter-flour-water base. 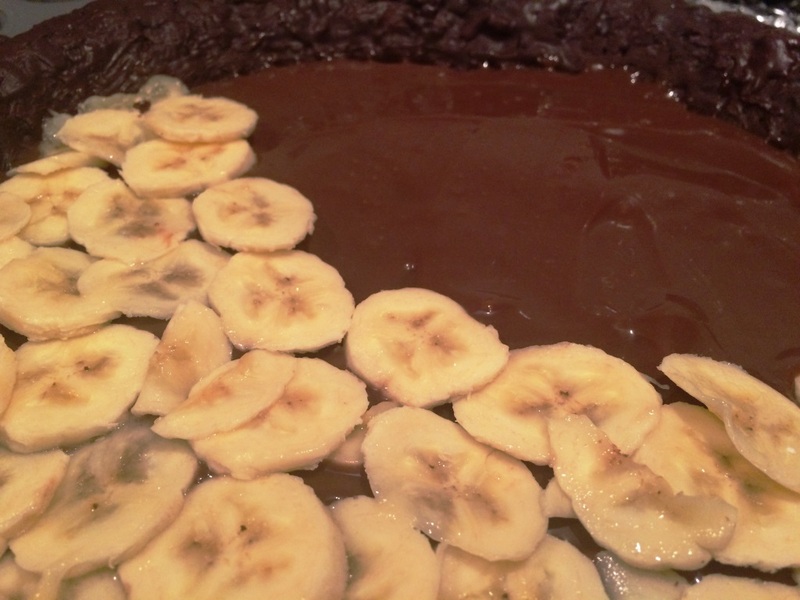 … but it didn’t come out quite as in tact! 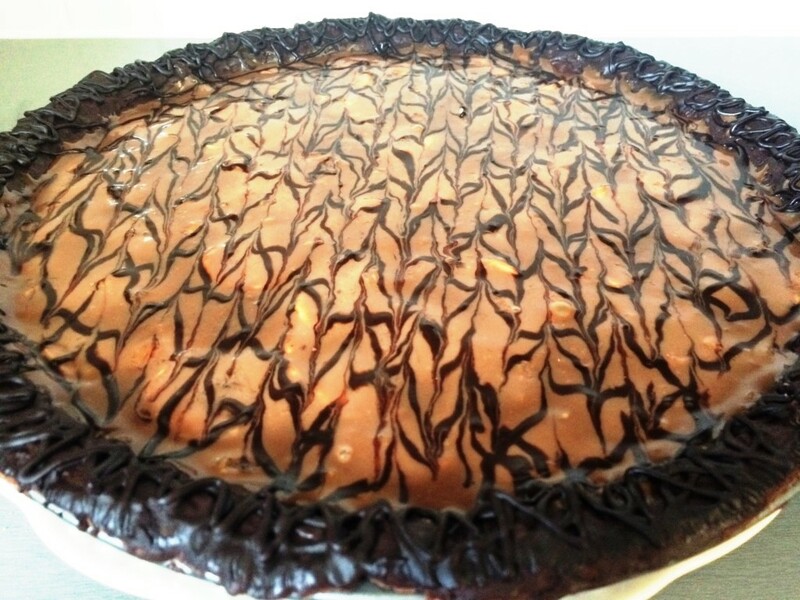 I didn’t want the filling to leak out or ruin the crispness of the pastry, so used a thin coat of melted dark chocolate over the cooled pastry to create a tight seal. 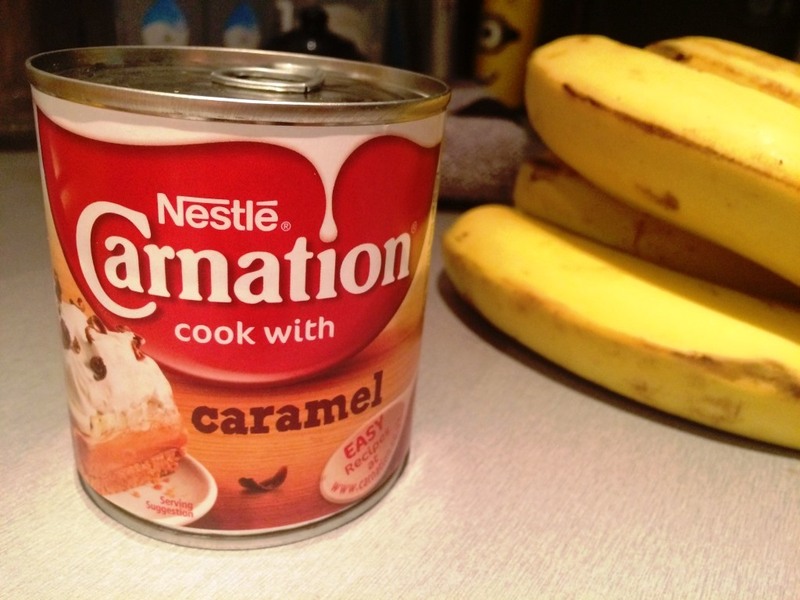 Once this was set the filling was quite simple – a tin of Carnation caramel (much easier than making your own from a can of condensed milk), mixed with some melted dark chocolate, and layered up over some thinly sliced bananas. 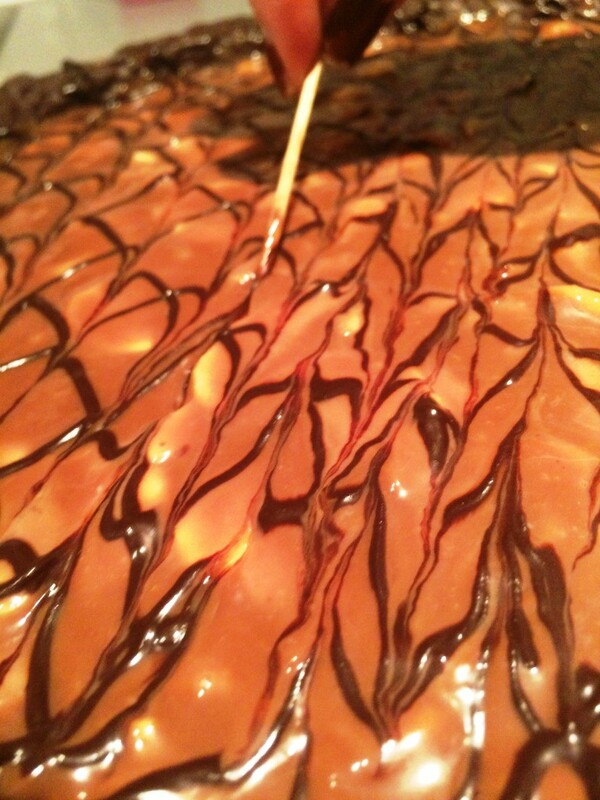 I think the issue with the caramel not setting was due to too much stirring to combined the chocolate. 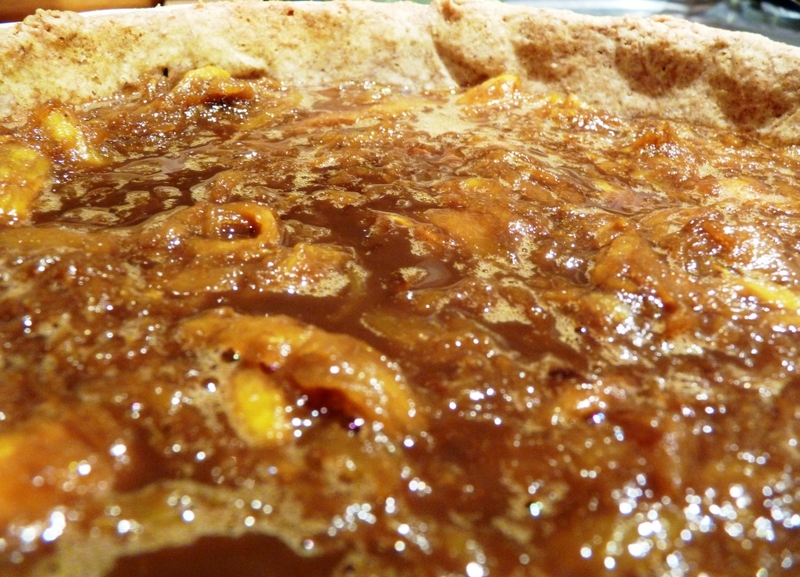 If I make this again I’ll boil it up a little with some more butter and sugar to make a thicker caramel that will set firmly. To finish I used some simple chocolate icing (cocoa, icing sugar milk), drizzled in lines and feathered with a cocktail stick. Easy but effective! 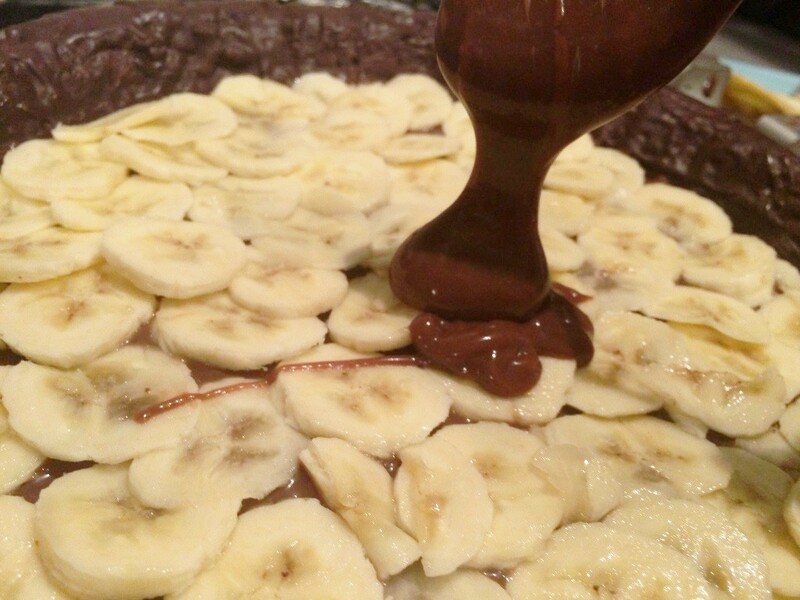 As I say not one of my favourite recipes but it still went down well – with that much chocolate you can’t go wrong! 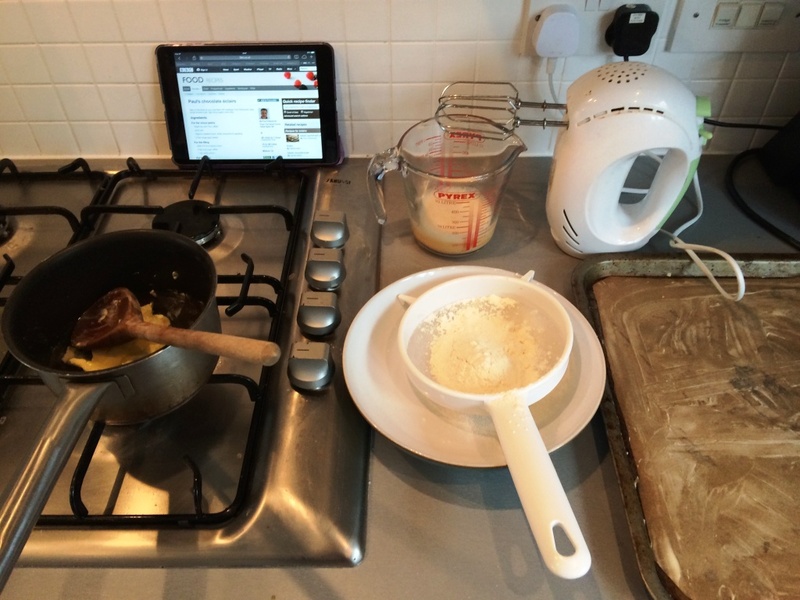 You can find out more about the Great Bloggers Bake Off by clicking on the link below. I have a confession to make. 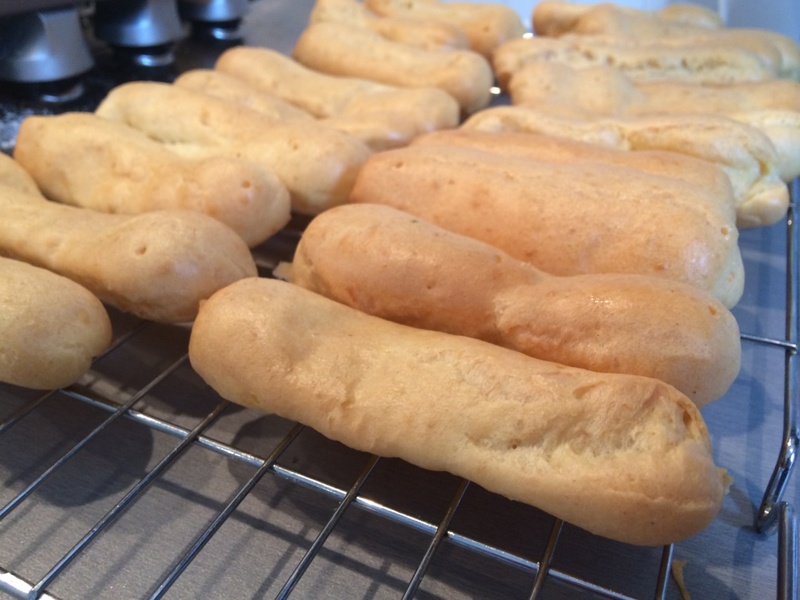 During last years bake-off, I failed at making choux pastry. 3 times. It was a Sunday afternoon and no matter what I did it wouldn’t go right! 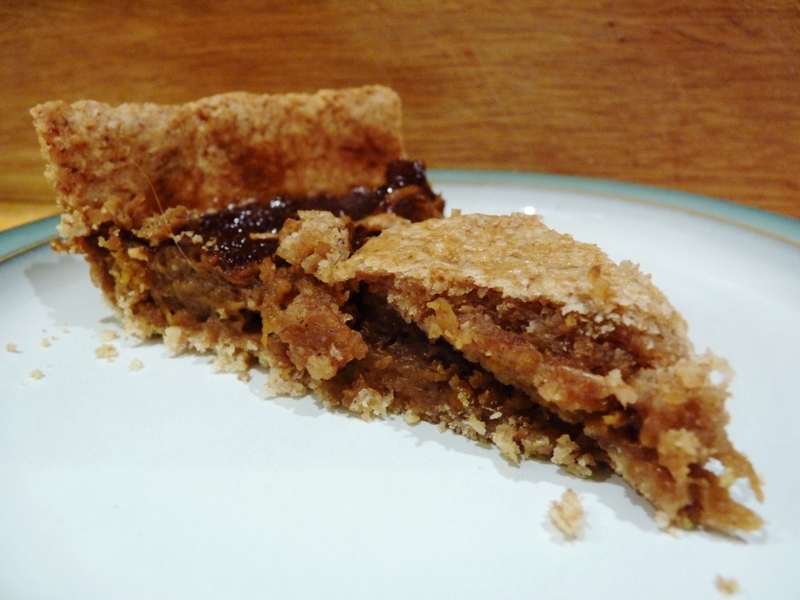 This time, as part of the second pastry week of this year’s Great British Bake-Off and #greatbloggersbakeoff2014 , I was determined not to be beaten. 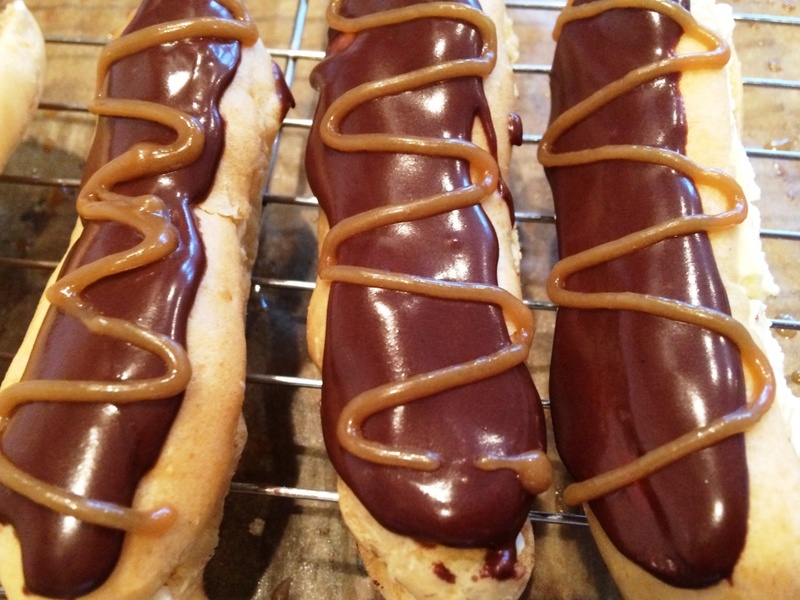 I used Paul Hollywood’s Chocolate Eclair recipe to the letter to avoid going wrong again – so won’t re-write it here. It’s definitely worth reading through a couple of times before you start so you know what’s ahead. 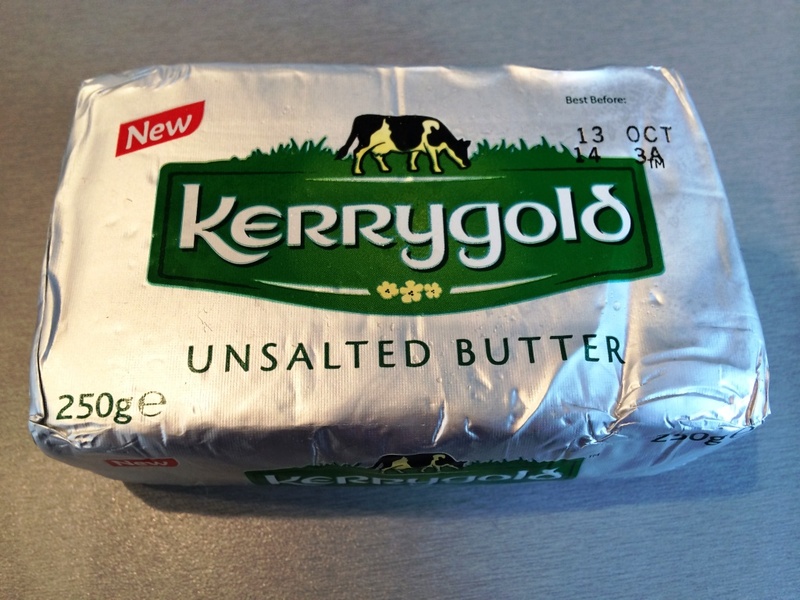 The lovely folks at Kerrygold sent me some butter to try, so this seemed a good place to start. 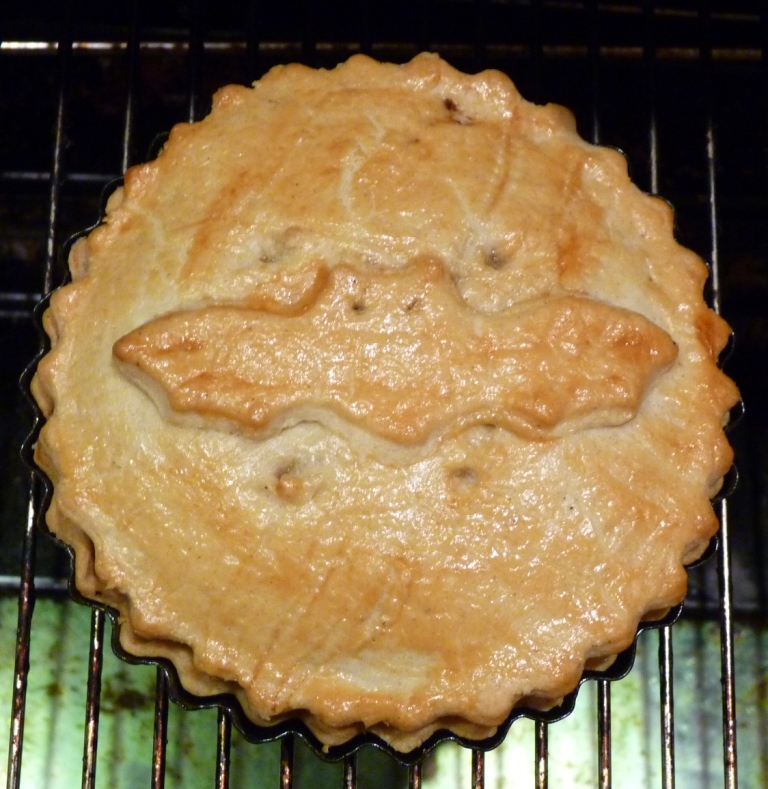 Maybe the lower-fat butter blend I have as standard in the fridge was to blame for last year’s failure? 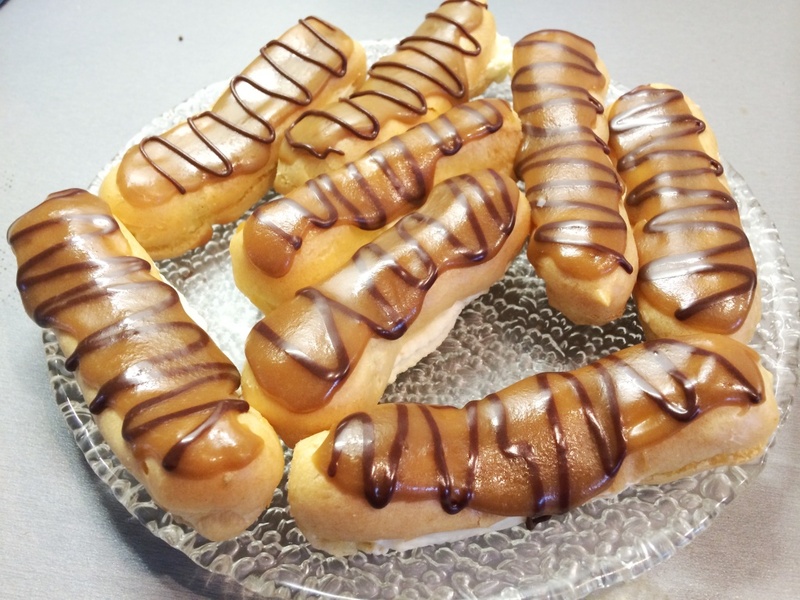 …and set about the choux pastry! 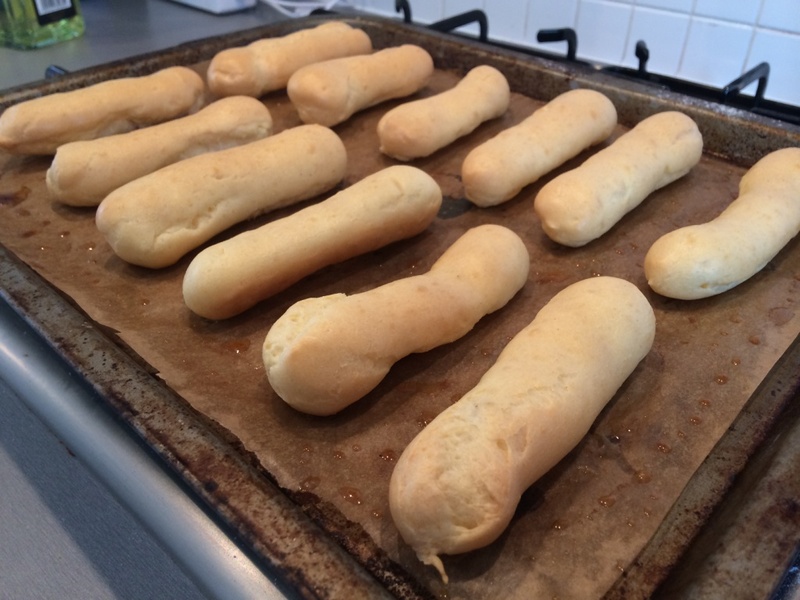 One of the main problems I find with making choux pastry is that it really doesn’t look like anything until it’s baked. 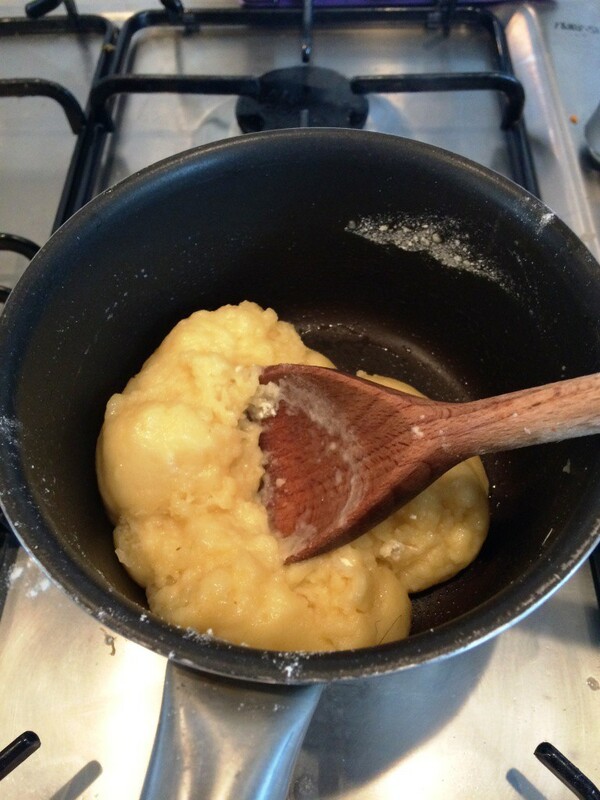 The ‘cooking a ball of flour, butter and water dough’ is both unattractive and uninspiring in my book, but, what Paul says…! 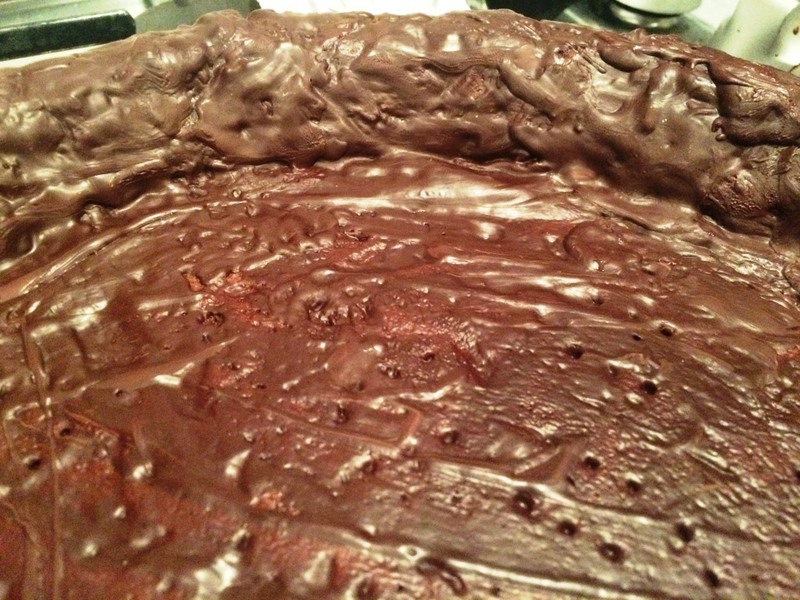 Dough satisfactorily ball-like and shiny, I put it in a bowl and set aside to cool. Suddenly it dawned on me where I’d gone wrong last year. Those five little words, ‘leave to cool until tepid’, (or the lack of them in my reading), were entirely responsible for my downfall. Cue flashbacks to last year and trying to beat eggs in the hot saucepan only for them cook and scramble… it’s like something from an outakes show! 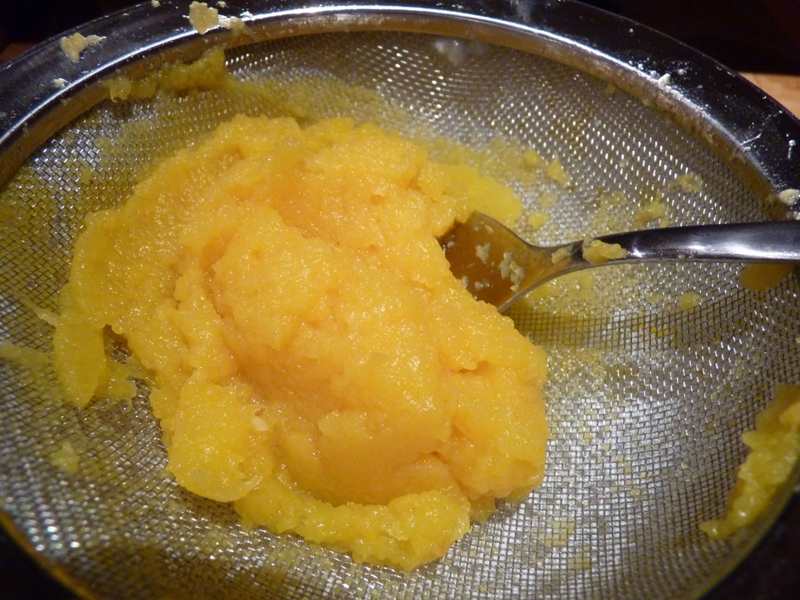 Cool and tepid, whisking the eggs in was happily much easier this time! 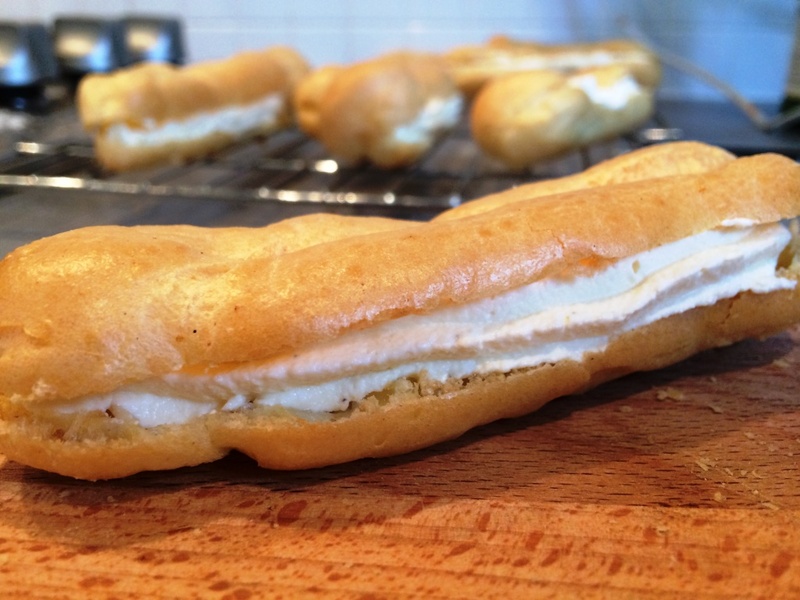 Next came the cream piping – rather simple but made much trickier in a warm kitchen, with the cream threatening to melt all the time. I don’t envy the bakers in that tent one bit! 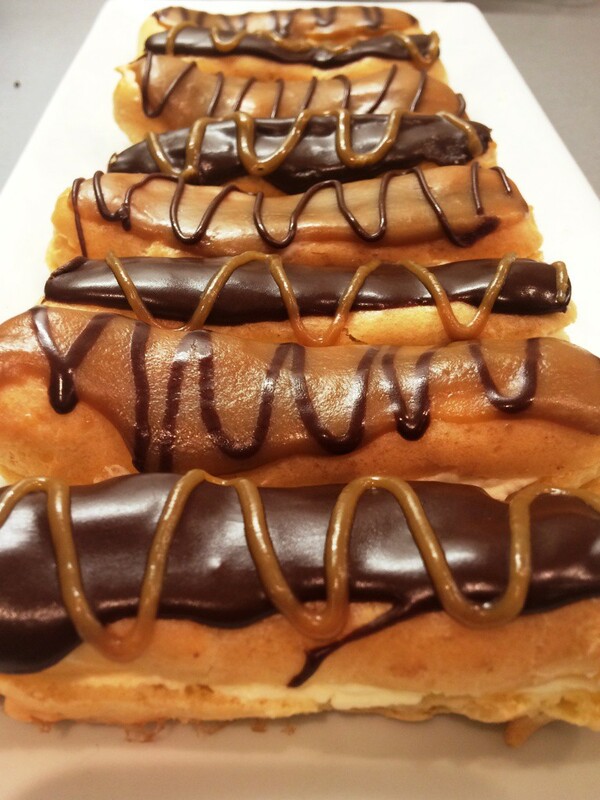 I finished both sets with a decorative drizzle of the other icing – chocolate on caramel, and caramel on chocolate. 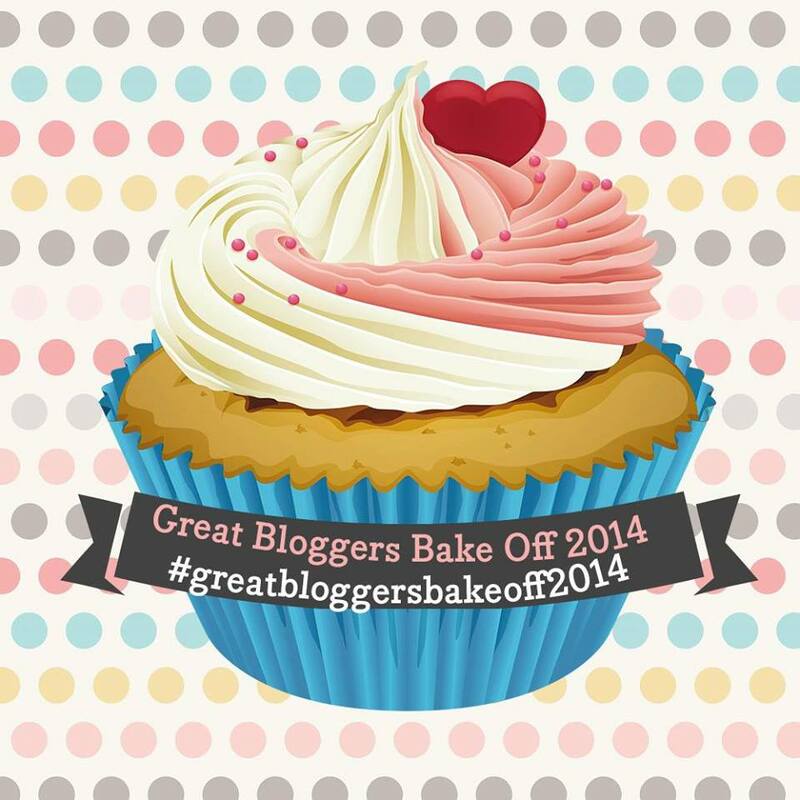 Read more about #greatbloggersbakeoff2014 here. 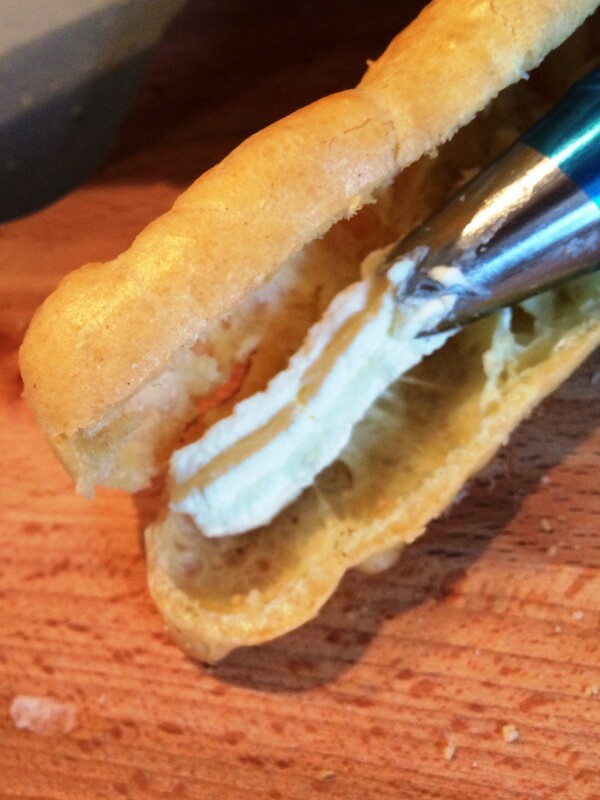 And for all the cat lovers out there – what better use of leftover cream? 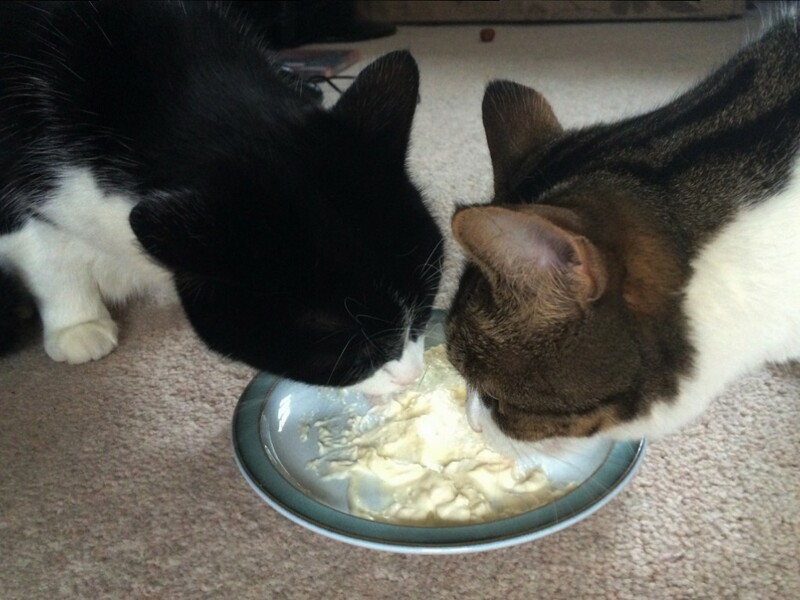 Chilli and Pepper have just turned 3 and are as mischievous (and ravenous) as ever! 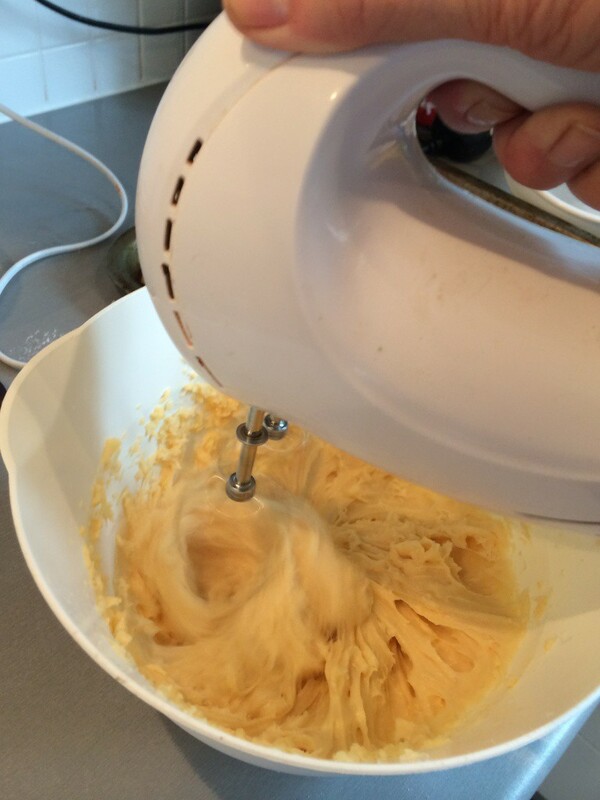 Disclaimer: I was sent some Kerrygold butter to use in my gbbo recipes. Opinions and bakes are all my own. 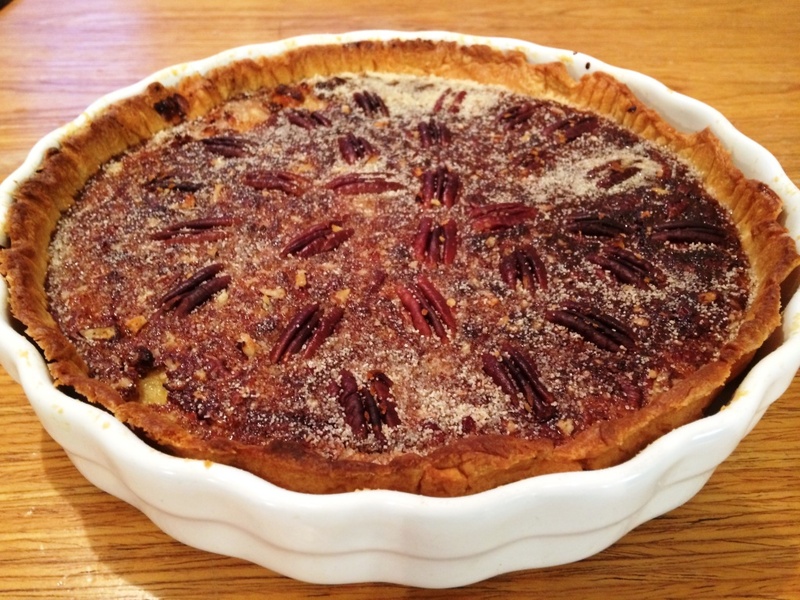 #greatbloggersbakeoff2014 and it’s pies and pastry week! 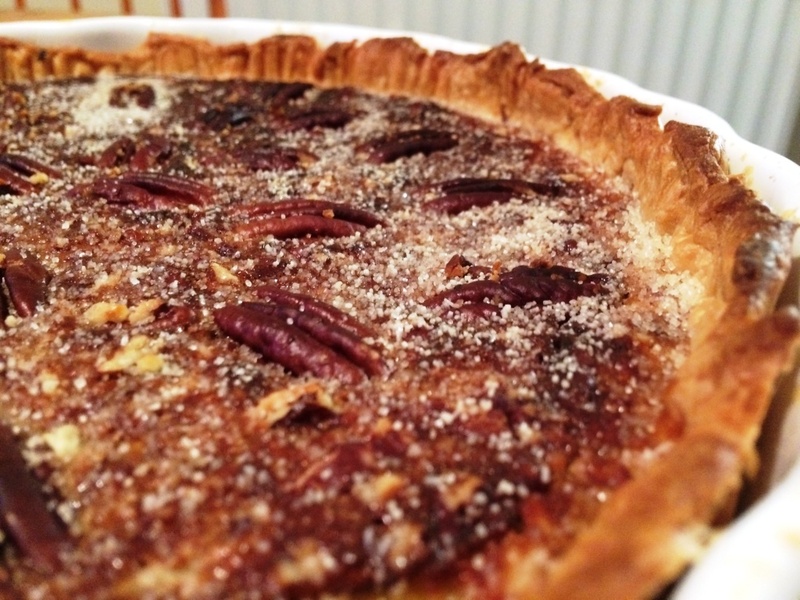 I remember my mum lusting over pecan pie when I was little, and when she made it, it was absolutely divine. 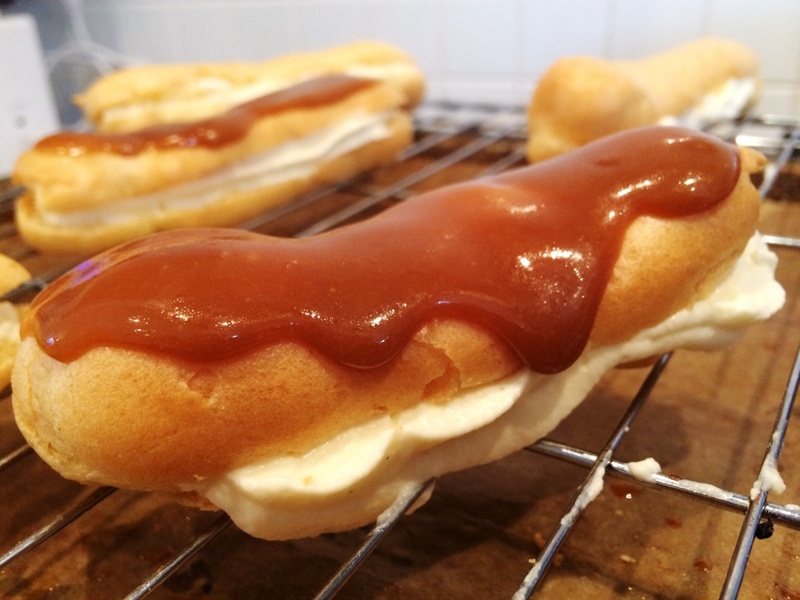 What better way to improve than with some sweet-yet-savoury salted caramel. 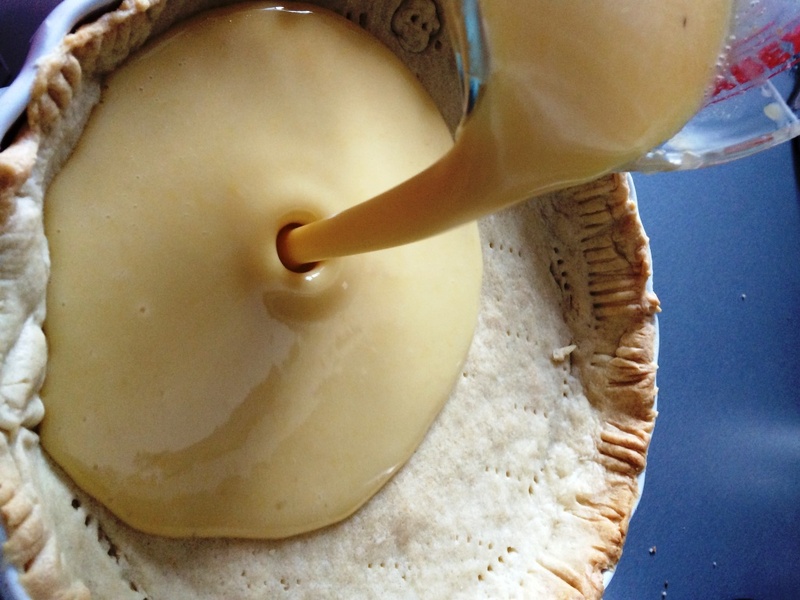 It’s actually quite a simple recipe (once you’ve made the pastry! 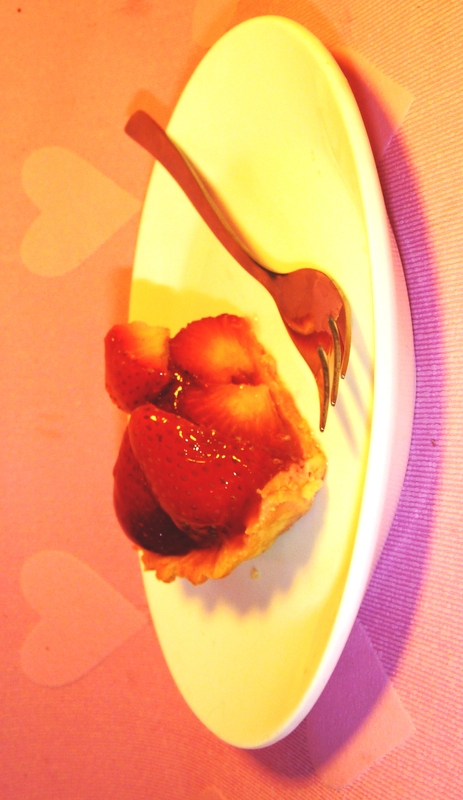 ), but looks and tastes wonderfully impressive to serve as a dessert. 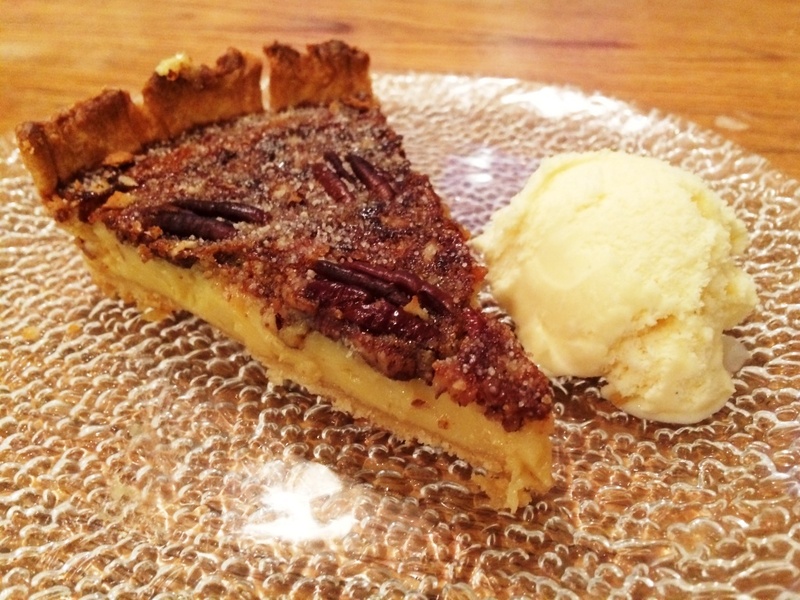 If you can, serve whilst slightly warm with a big scoop of vanilla ice cream. Quite frankly divine, so many amazing flavours on one little plate! 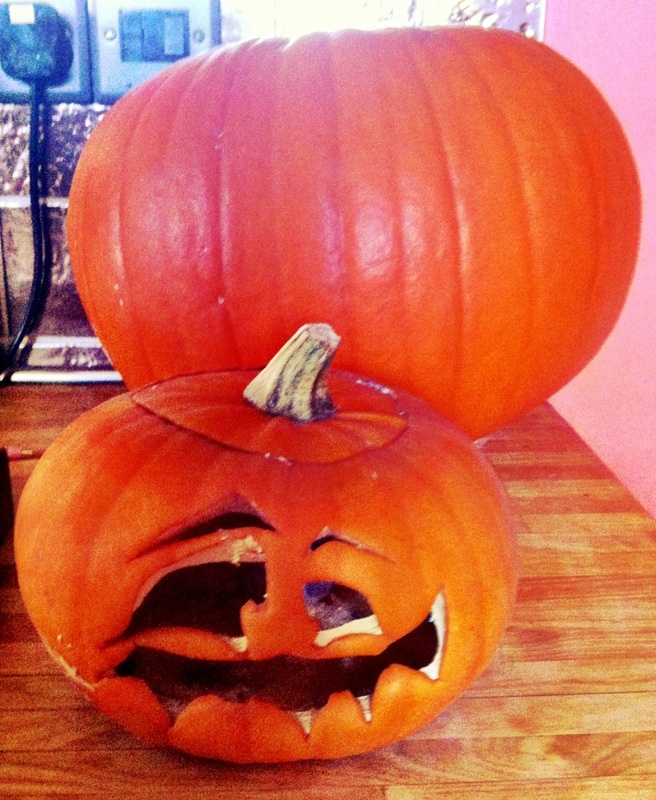 If last weeks pumpkin was a baby, this weeks is truly a monster. The monster in the background was home-grown by my dad, and even though he claims they didn’t grow very big this year it sure looked like a whopper to me. Bringing it home in the car it took up the whole passenger seat, and I was tempted to put a seatbelt on to keep it from rolling around! As another measure of scale – it was nearly as big as our two (fully-grown but not that large) cats, Chilli and Pepper. 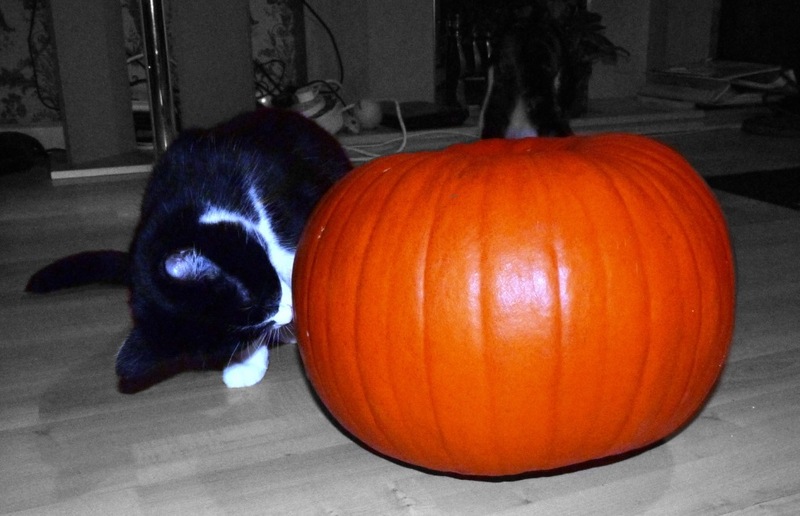 Are cats supposed to like pumpkin? They couldn’t quite figure it out in any case! 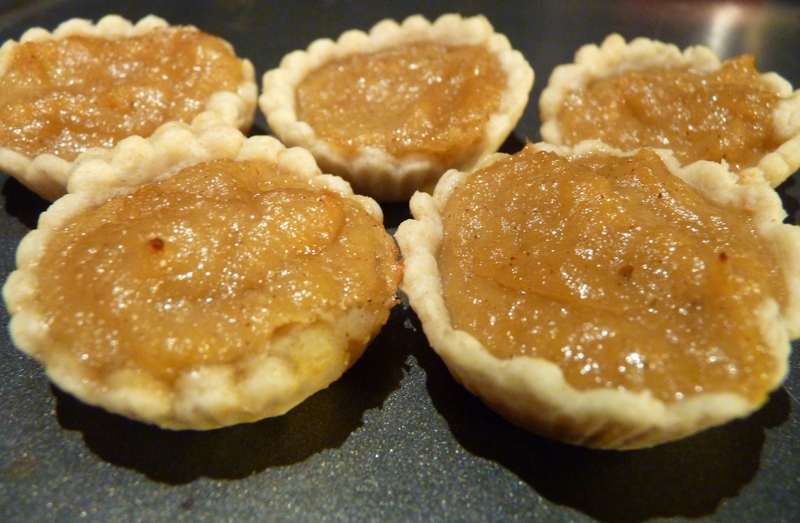 Because I’d made quite a big pumpkin tart this week, I kept only a little of this one for baking. 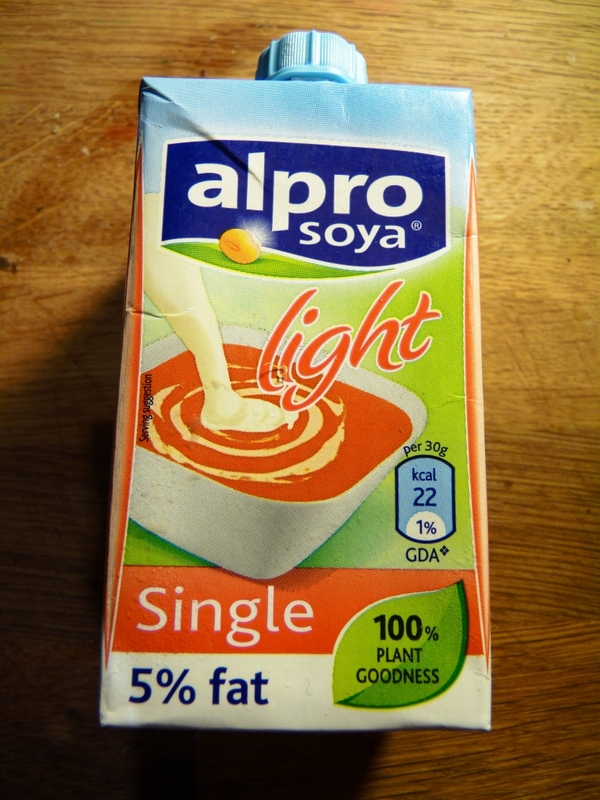 The rest was used in some delicious pastas and risottos, and finished off last night in a creamy pumpkin soup. Yum! 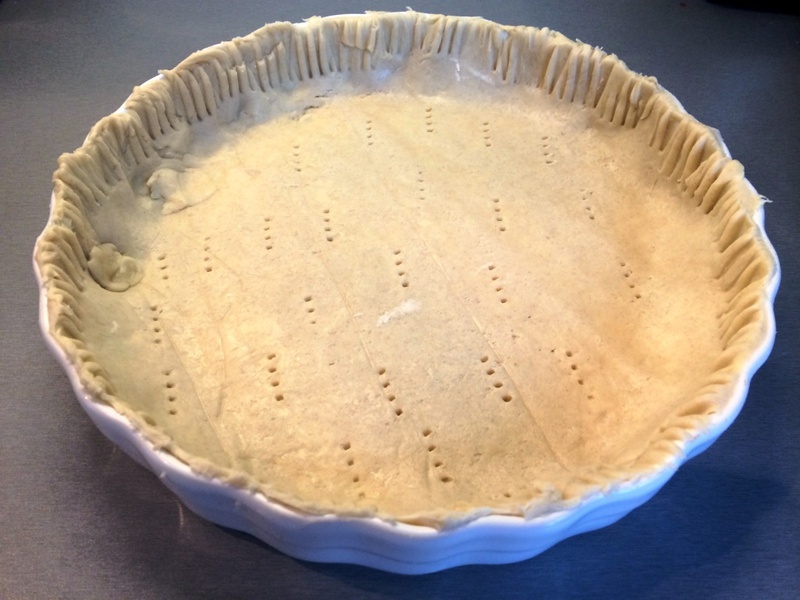 I very loosely based my pie on this bbc recipe, although I’m rather disappointed they suggest a shop-bought pastry case when they’re so easy to make at home. 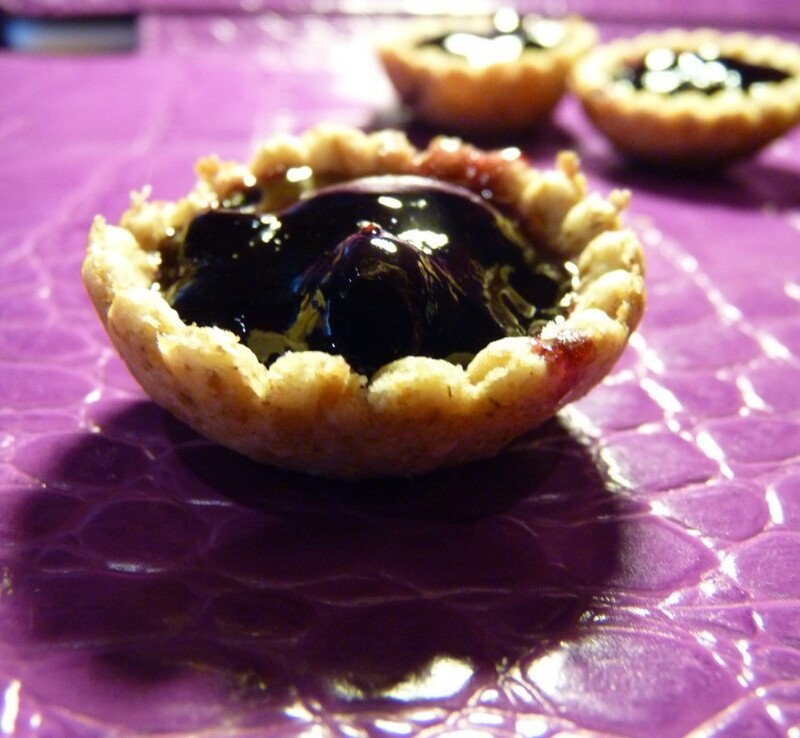 The following is for a teeny little tart of approximately 3-4 inches, but should easily scale up. Rub the butter into the flour using light touches. 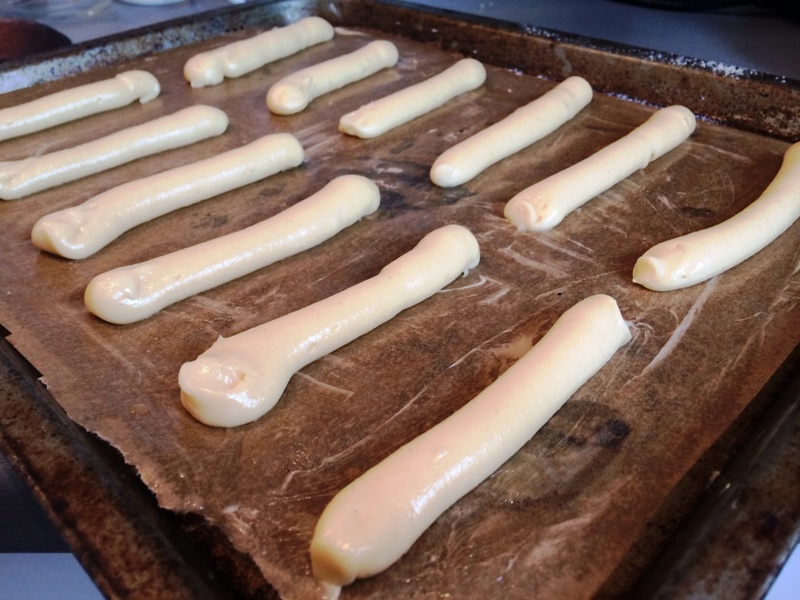 Add a little water at a time until the pastry mixes to a stiff dough. 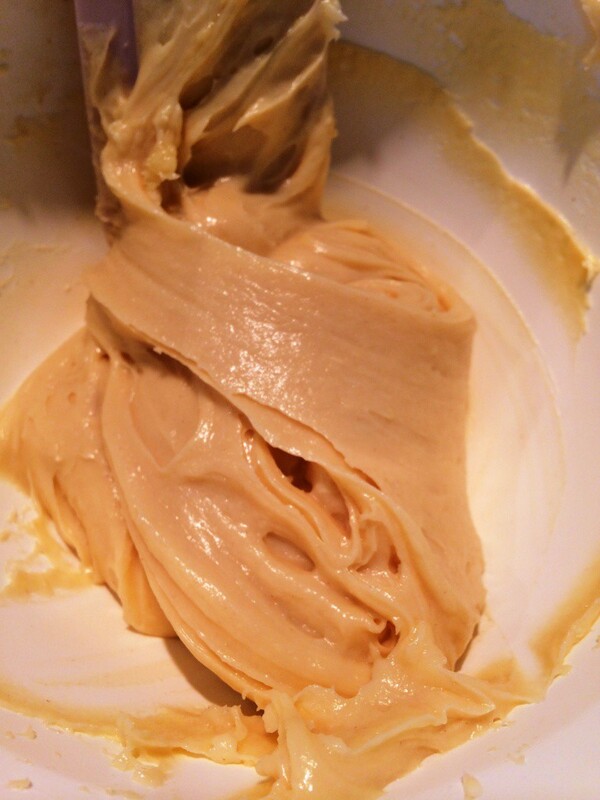 Refrigerate for at least 30 minutes before rolling. 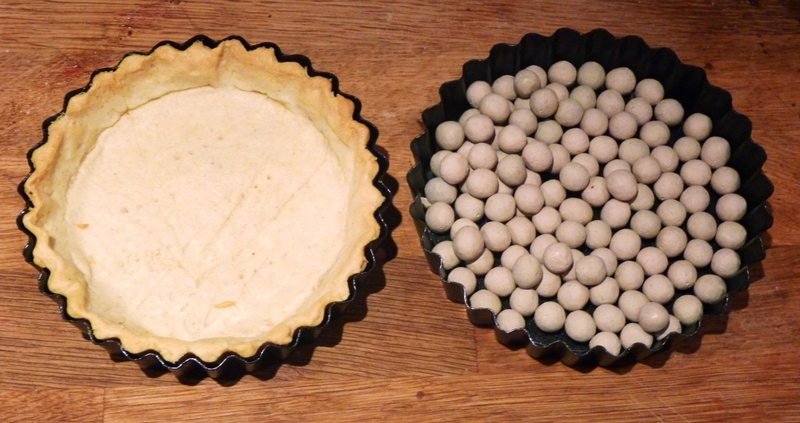 Remember to save 1/3 of your pastry for the lid! 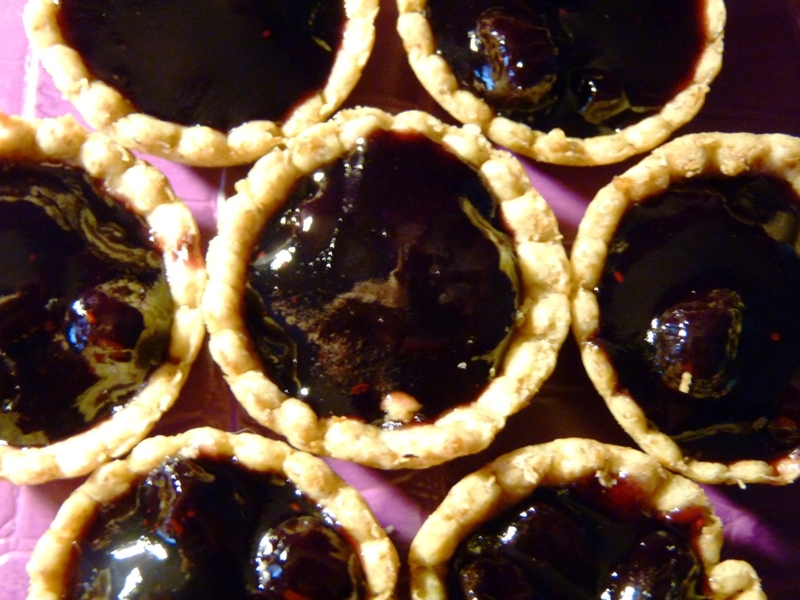 I made my pastry case in a mini, loose bottomed tart tin. 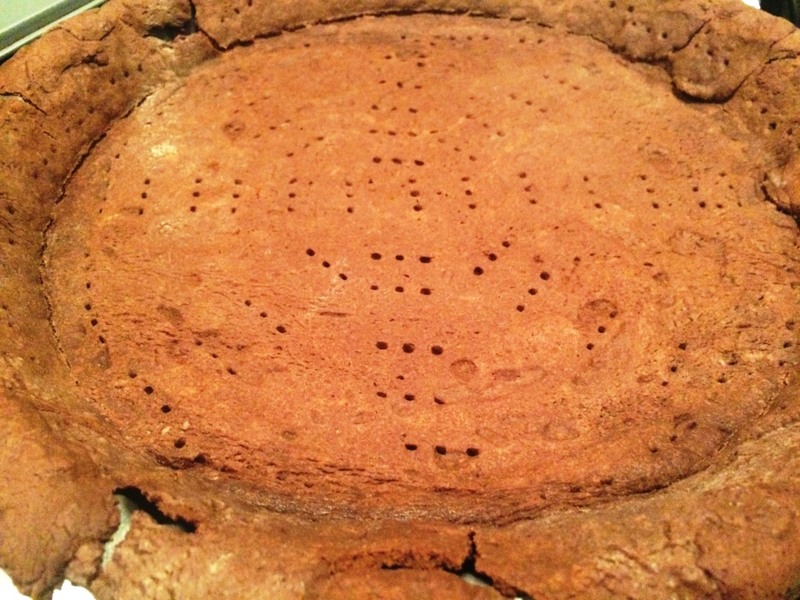 I blind baked it for around 15 minutes at 180 degrees – producing a crisp, slightly golden case (the ceramic baking beads had just been decanted into a second tin so the case could cool down). 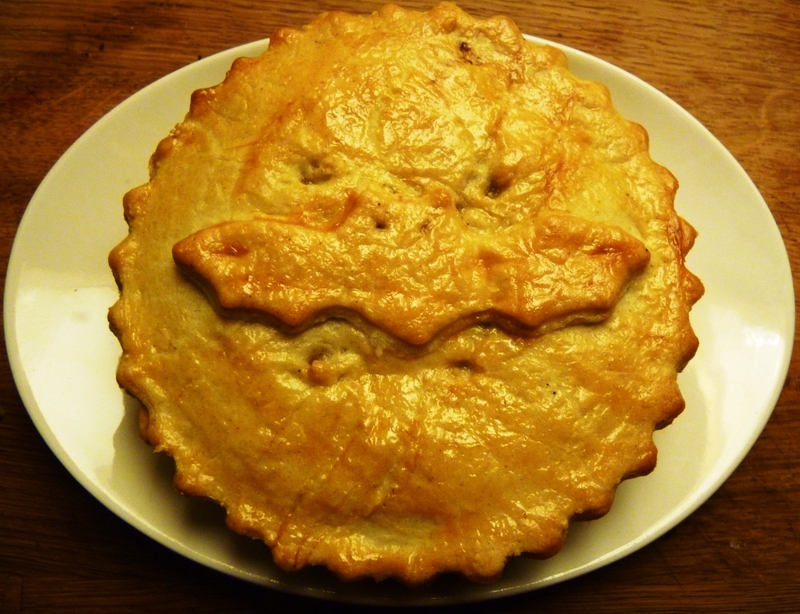 Blind baking is recommended for this kind of pie, as it has such a moist filling you are in danger of the dreaded soggy bottom if the pastry is not pre-cooked. 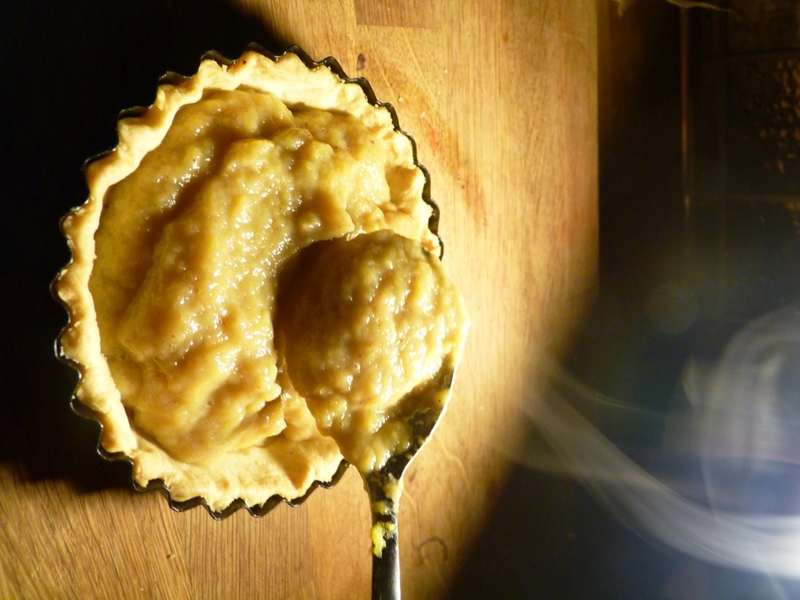 As for the filling, well, this is where I improvised rather a lot on Mr. Worrall-Thompsons recipe. Steaming the pumpkin, boiling this that and the other. Far too complicated! 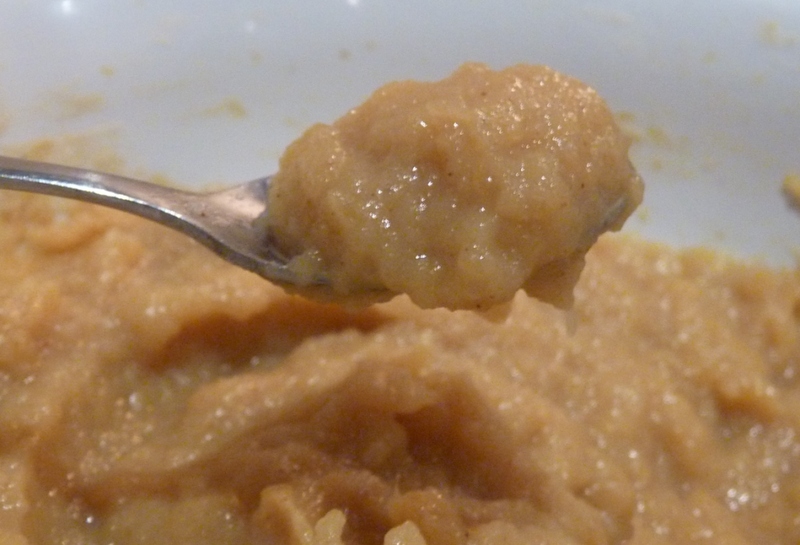 I was a bit slap-dash with throwing things in the bowl so quantities are a little approximate. 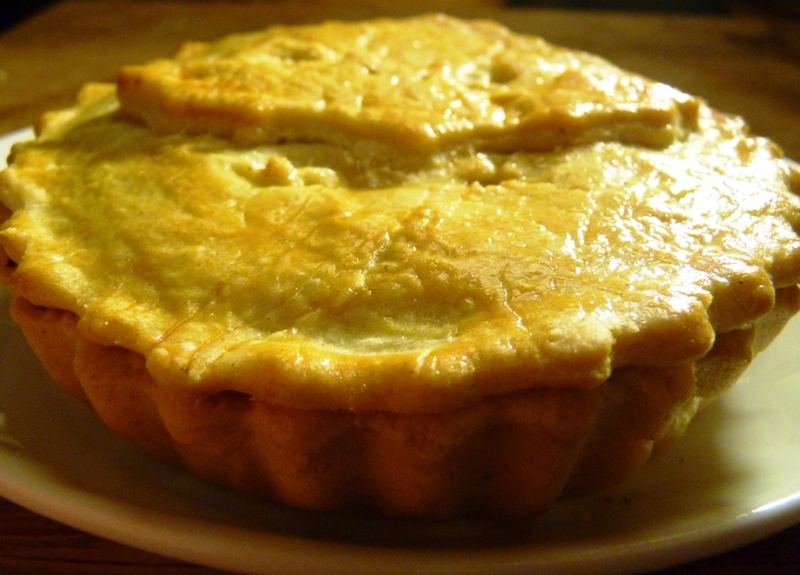 – brush a little egg round the top of the pastry case before placing on the lid. 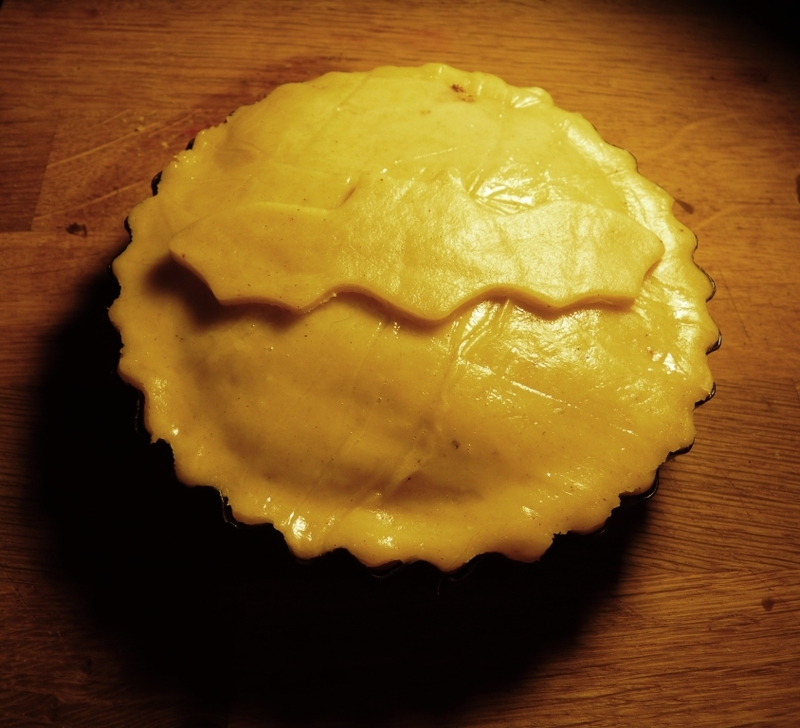 A little while later I carefully turned it out of the tin and immediately fell in love with its’ cuteness – such a perfect little pie! 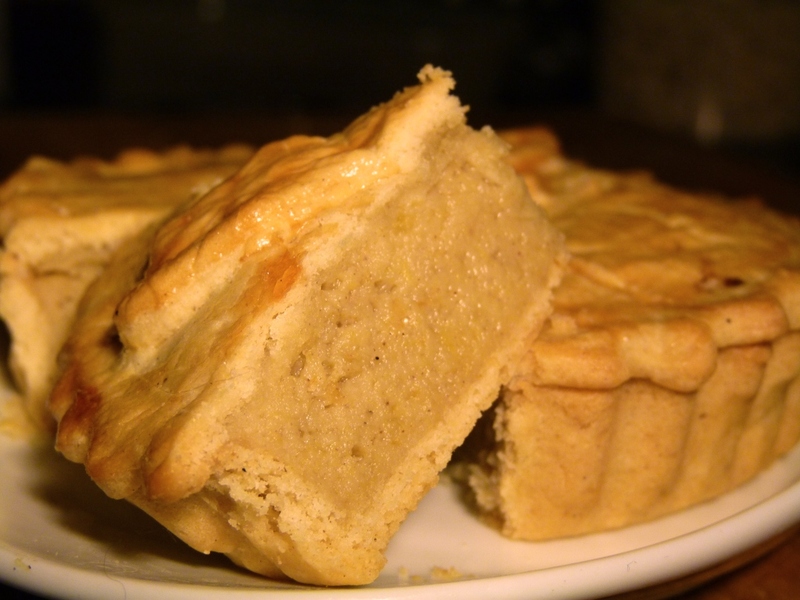 Once cut open the pastry was crunchy and crumbly, and the filling a moist, creamy just-set texture. 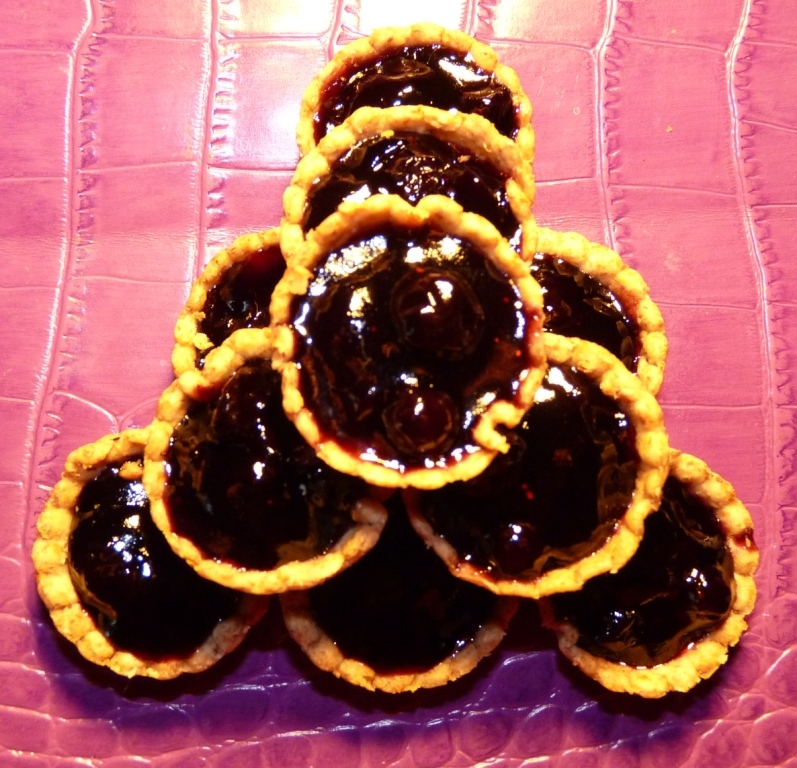 But how could I forget the piece de resistance – you are surely not still reading for the baking! Another masterpiece carving to finish with. 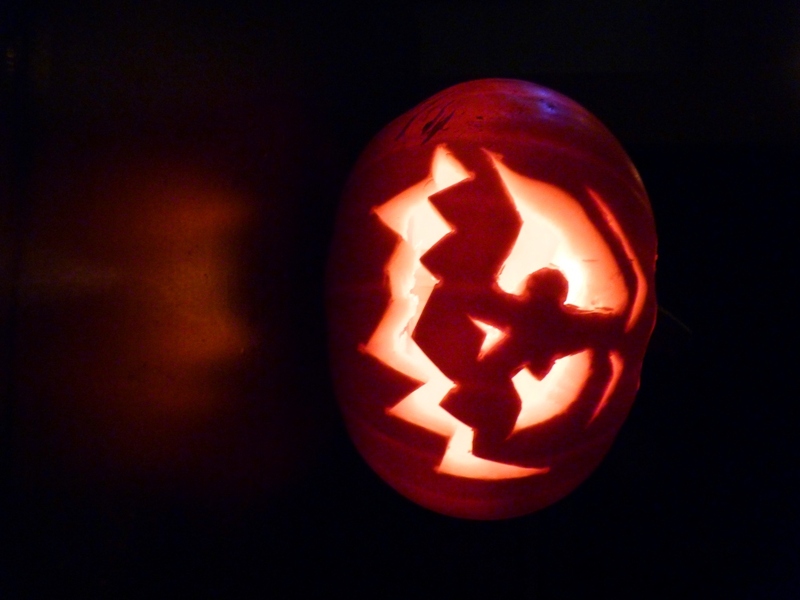 Who’d have guessed you could have a whole evenings’ fun with a pumpkin, and one that cost only £1 from tesco! With Rob carving and me baking we had great (and tasty) fun; I can’t share an exact recipe as such as it was a bit of a make-it-up-as-you-go-along, but I hope it gives you some halloween inspiration. 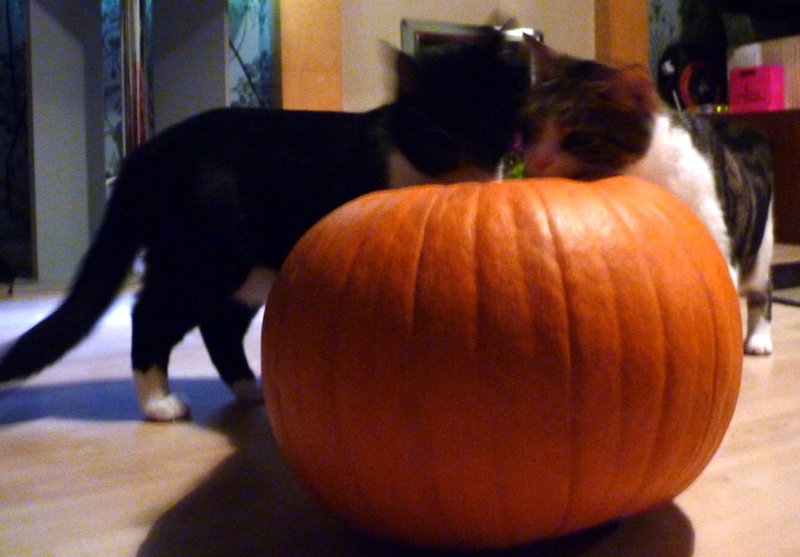 The pumpkin was only little, about 1.5 kilograms in total, but perfect for us to have a little play. I set Rob to work scooping (with the promise he could carve whatever he wanted to afterwards) – and am certain he had no idea what he was in for! 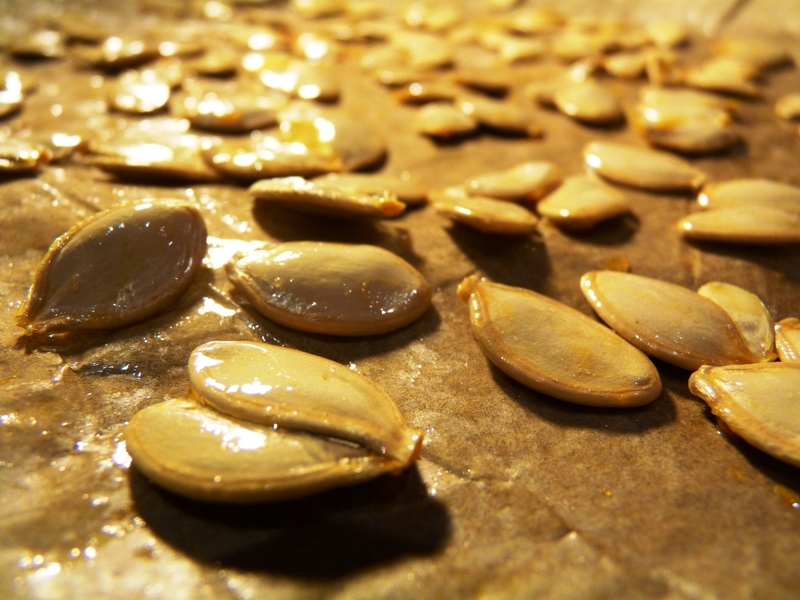 About an hour later I ended up with about 600g of pumpkin flesh for my tart. 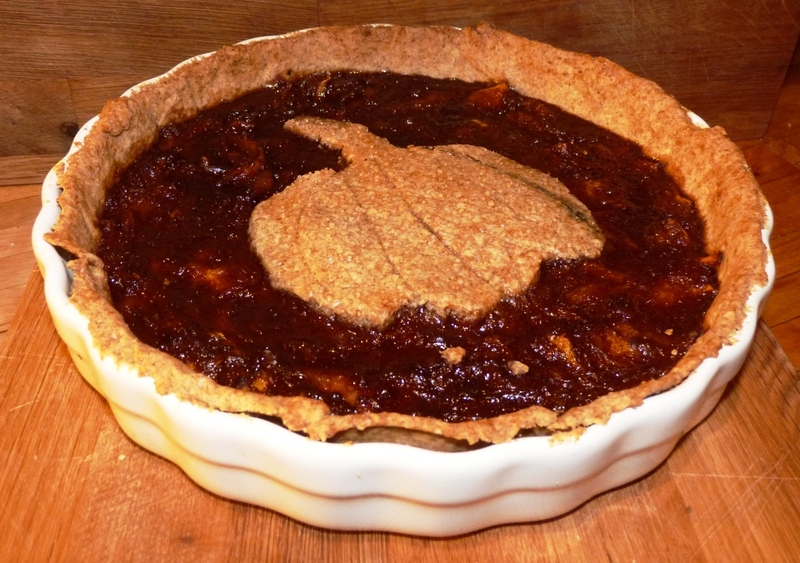 In the meantime I’d made some wholemeal pastry, rested it for 1/2 hour, and blind baked my tart case (so it wouldn’t get soggy from the filling). 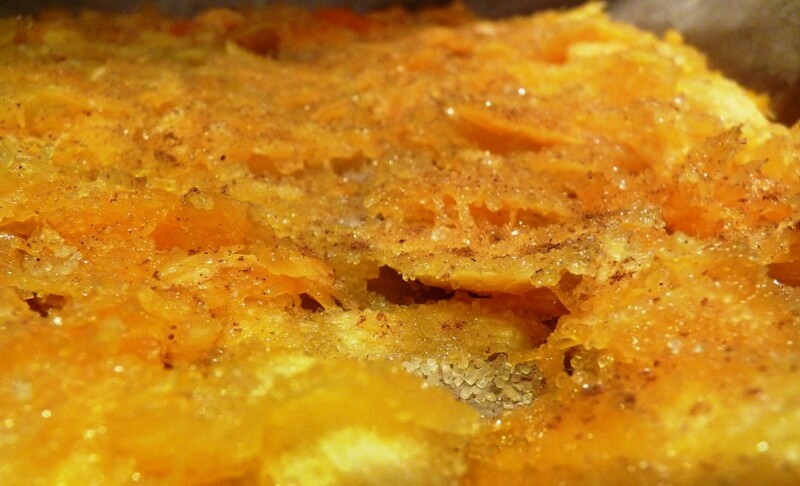 Because it was already in small bits from being scooped, I spread the pumpkin on a baking tray, sprinkled with brown sugar, nutmeg, cinnamon, and a little ginger, and roasted for 20 minutes. 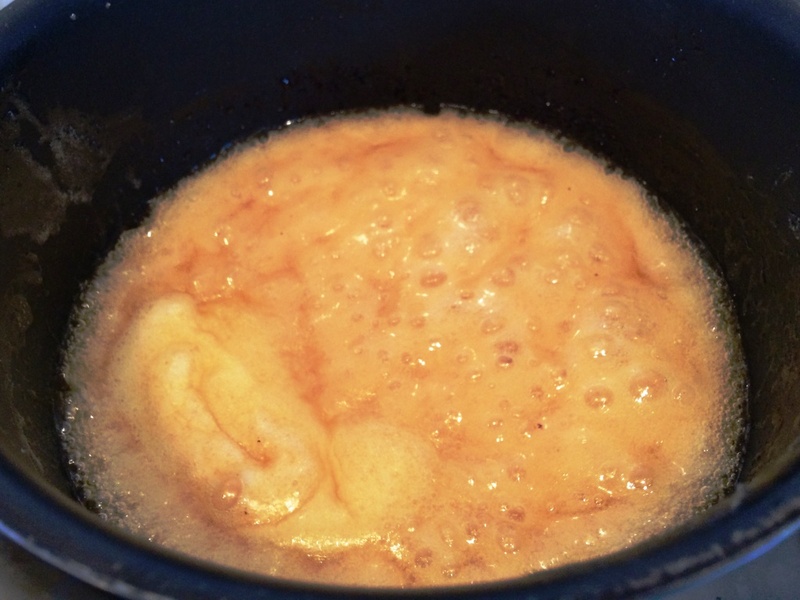 Then I mixed in just a couple more ingredients – 2 eggs, a teaspoon of treacle and a sprinkle more sugar. 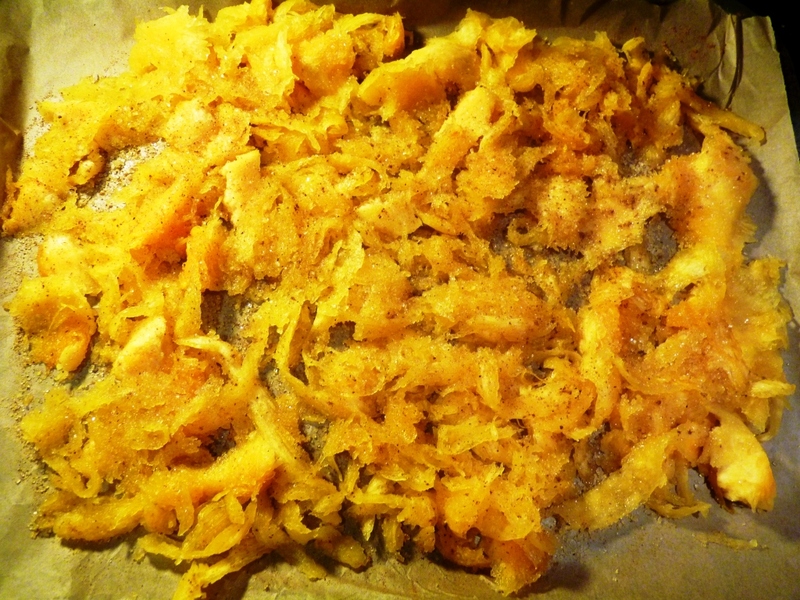 The spices were already smelling great and after testing a little of the roasted pumpkin I decided not to add any more. 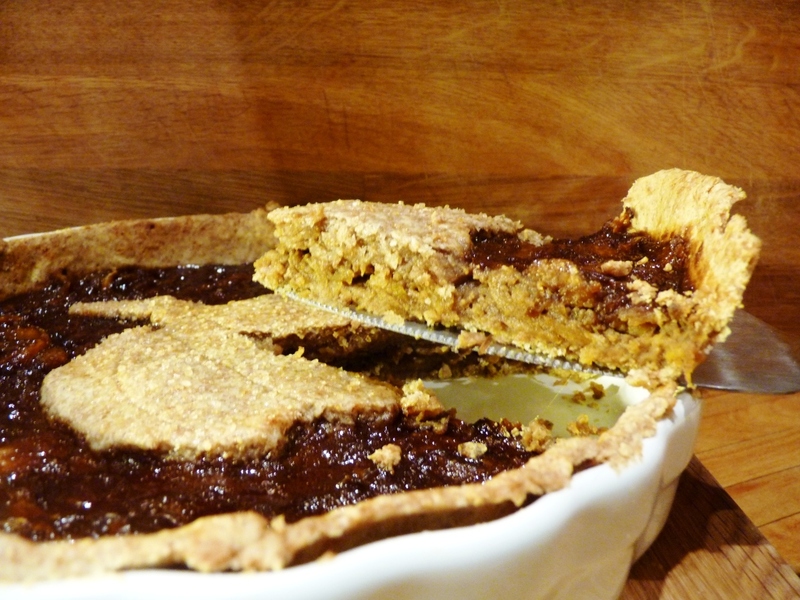 All mixed together, I poured the pumpkin mixture into the tart case and topped with a pastry pumpkin (art was never my strongest subject), before baking for about 20 minutes until just set. 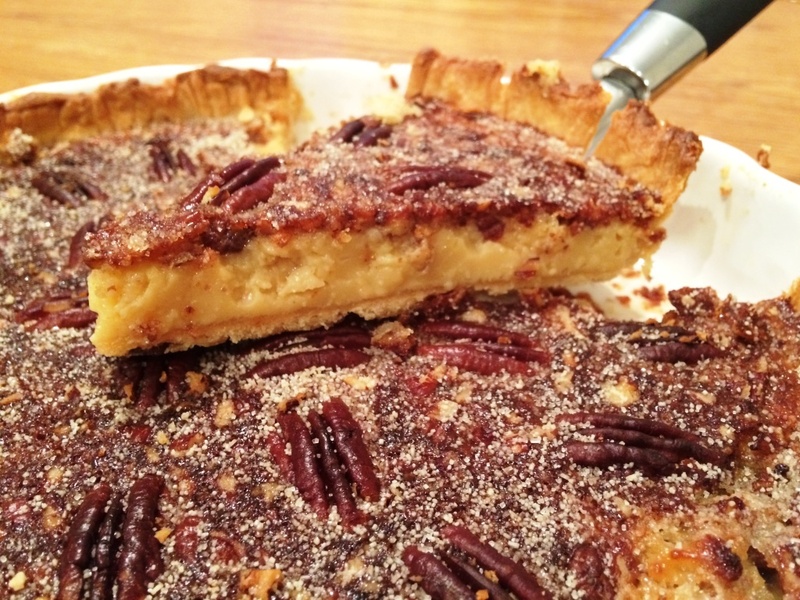 A delicious smell of sugary spices wafting through the kitchen and the tart was cooked – perfect with some custard, ice cream, or even a splash of fresh cream. 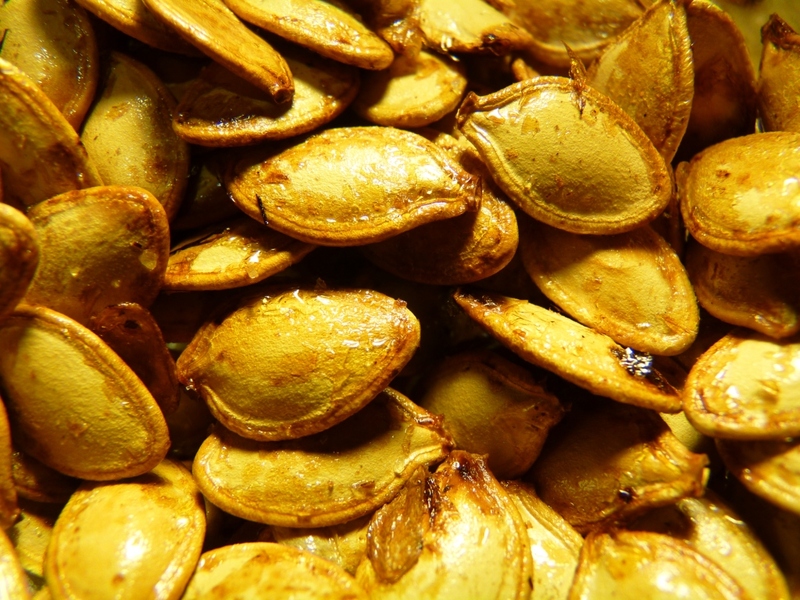 Very little goes to waste in my kitchen – so I also spread the pumpkin seeds out on a tray (removing the yucky goopy stringy bits that hold it together), brushed them very lightly with olive oil, sprinkled with salt, and roasted for about 15 minutes. 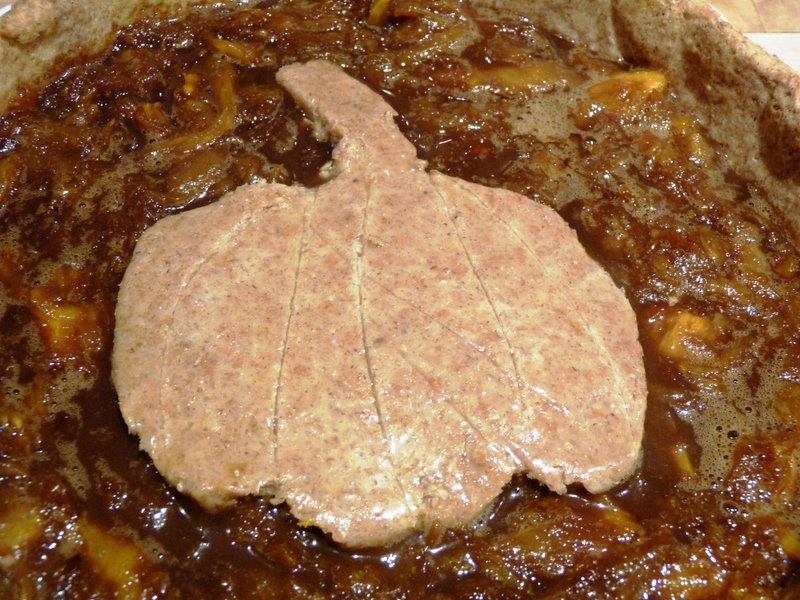 Tasty, healthy, and a great bonus to making pumpkin pie! 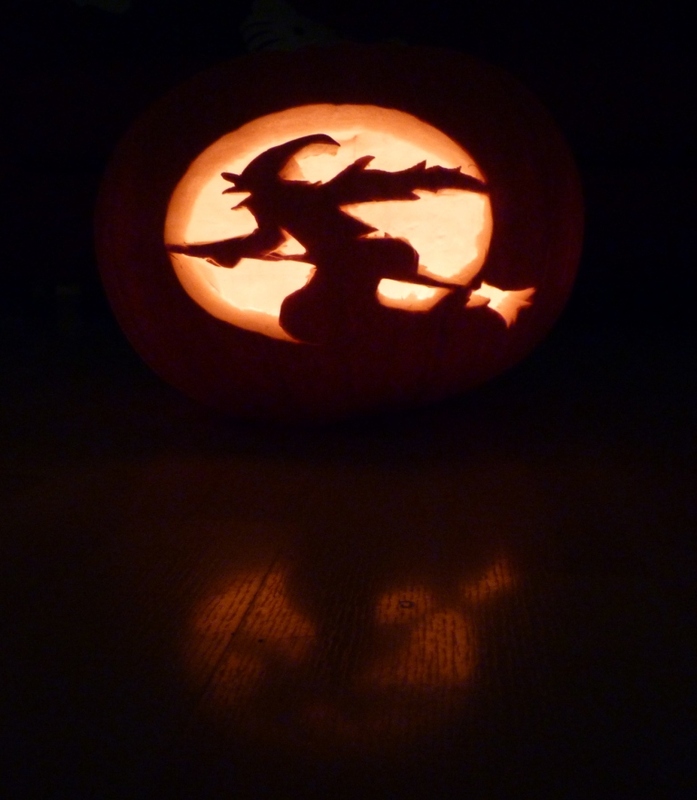 Oh and the pumpkin? Well, the boy done good! He had a whale of a time carving out the face, and sat proudly watching the candle flicker inside. 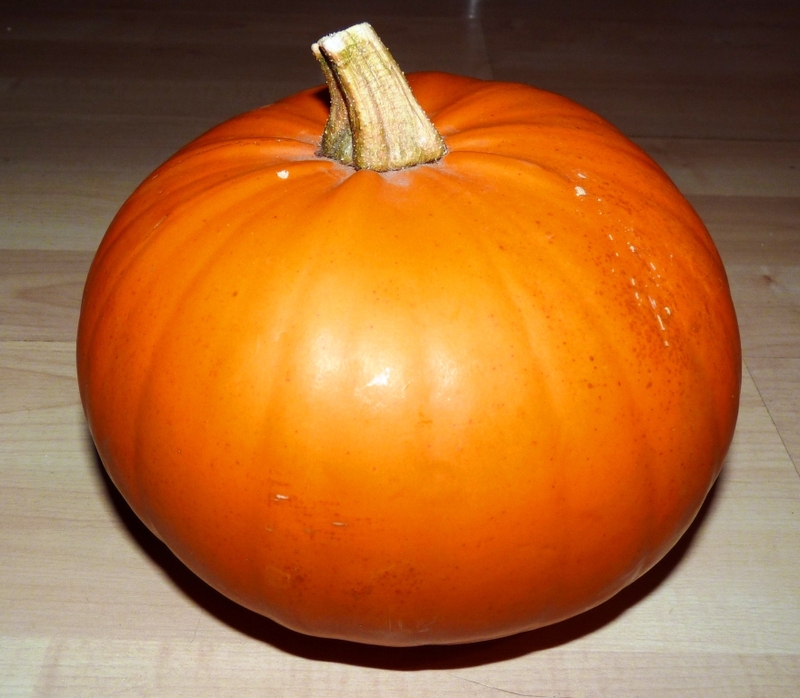 And despite his despise for carving it out in the first place, apparently he is buying another at the weekend, bigger, more elaborate – and more pumpkin pies on the way! After making a delectable strawberry birthday cake on Friday, we still had a lot of strawberries to use up (thanks Costco, 1.5kg for £4!) Not that I’m complaining, they are big, juicy fruits, and so nice to enjoy in this lovely weather we’re having. 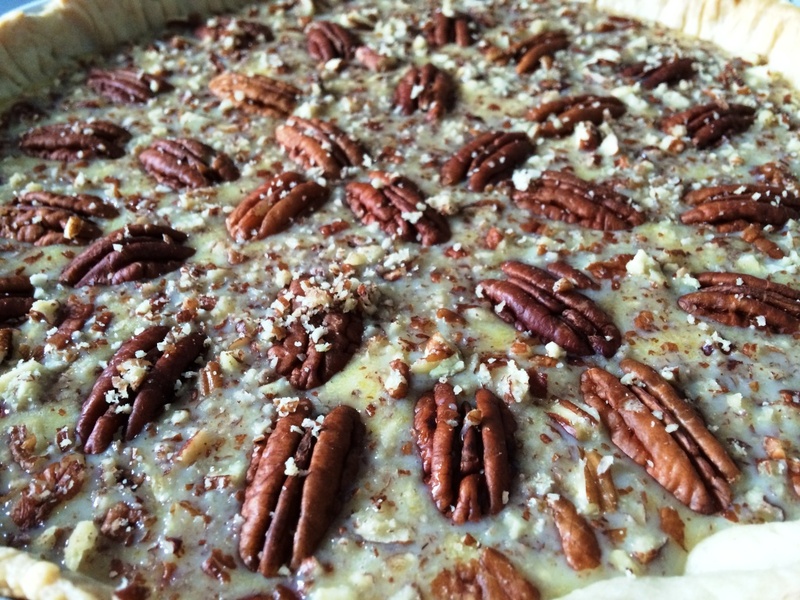 Of course this got me thinking – what more could I bake with them? In the sticky heat (it was 80% humidity yesterday, yuck!) I didn’t want something that was going to need a lot of time in front of the oven or even in the kitchen – I’d rather be outside with a cool drink (or giant ice cream sundae). 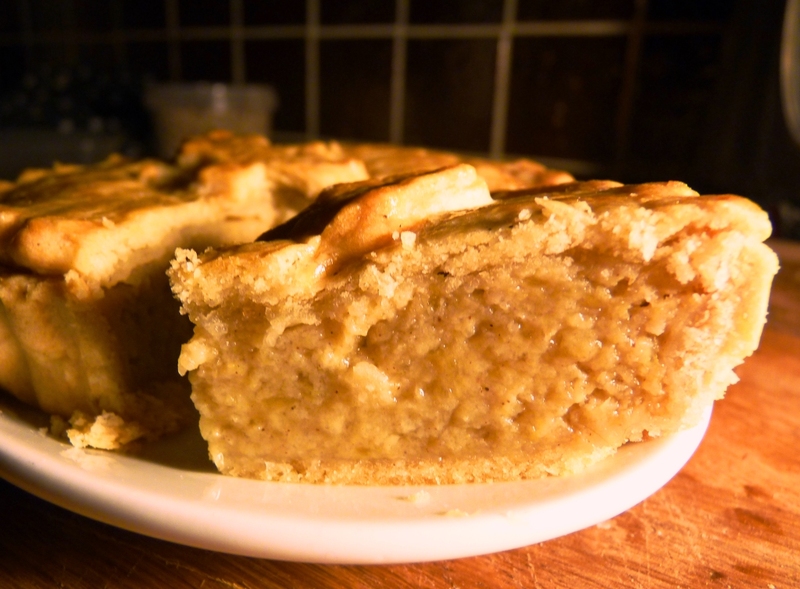 The pastry was made from Delia’s shortcrust recipe – she has such lovely simple steps on how to make it perfectly, I’m not even going to try and recreate them here. 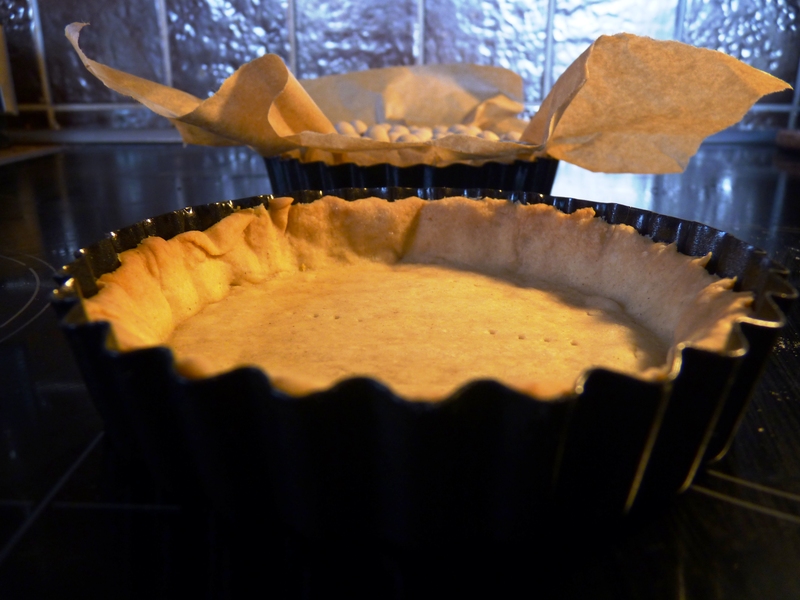 For my 2 small tart tins, I used 75g of flour, and 35g of fat (a mix of butter and trex). 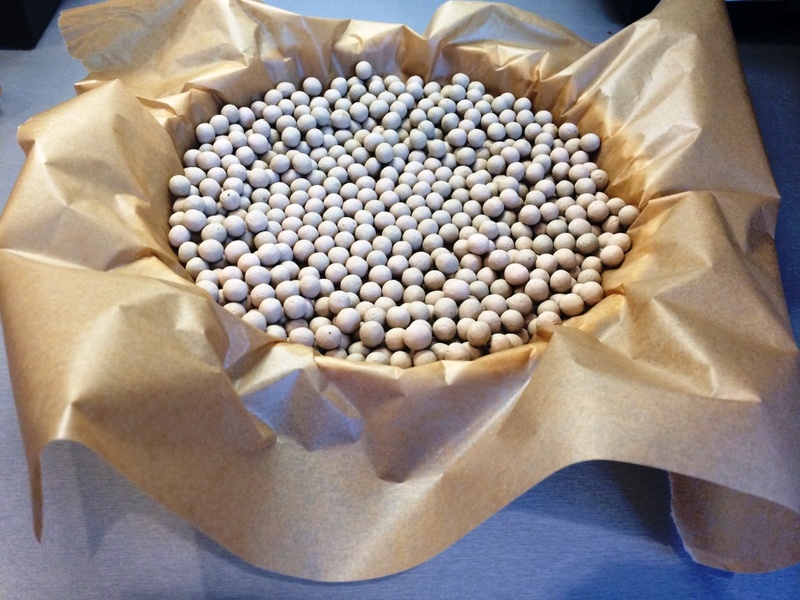 After chilling in the fridge, it rolled out smoothly and easily, before blind-baking (with ceramic baking beads) at 180 degrees C in our fan oven. And that was the hardest bit done! 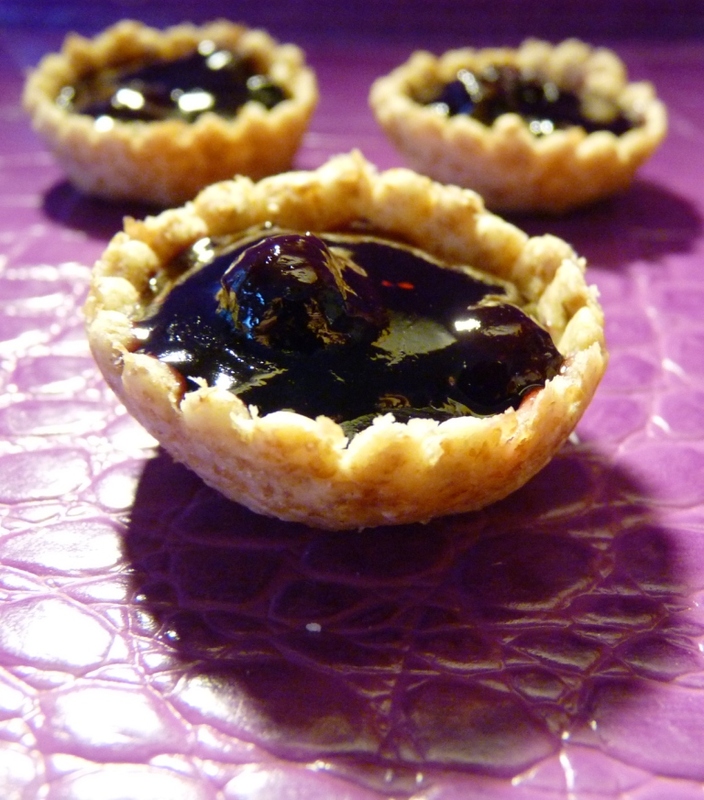 At the same time as the pastry came out of the oven, I mixed up the Quick Gel – this is an essential – normal jelly will soak into your base and not set quickly enough at all. 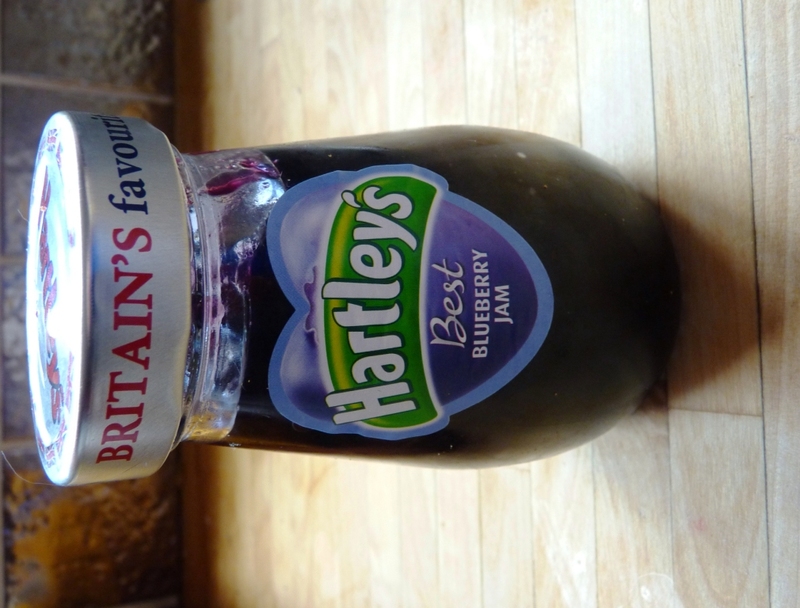 I picked mine up easily in the supermarket – on the same shelf as the normal jellies. 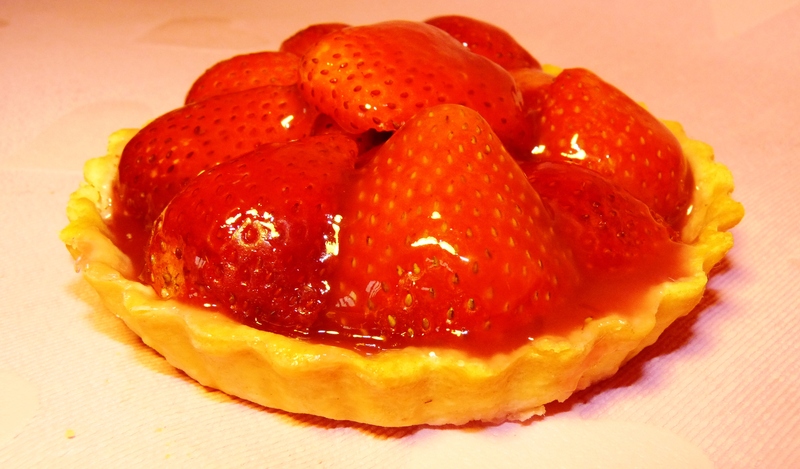 When the 20 minutes was nearly up, I started slicing the strawberries and arranging in the pastry cases. 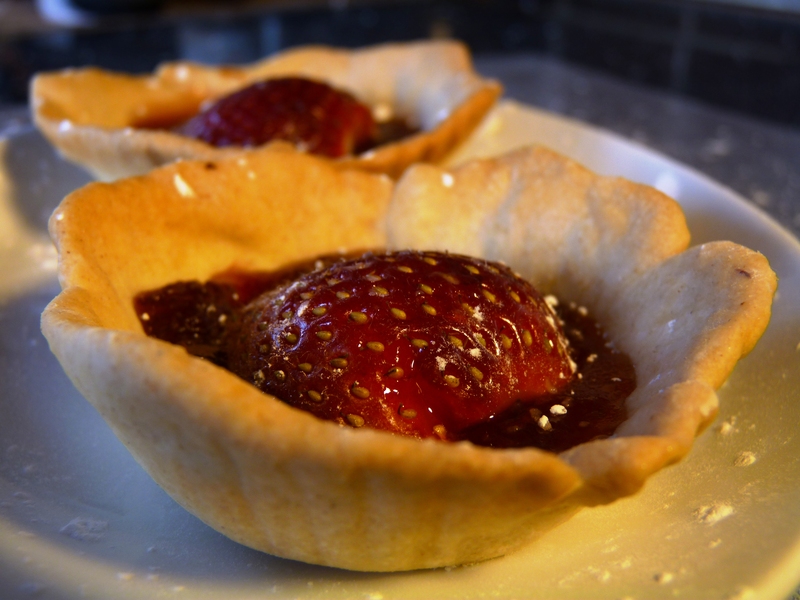 After another quick stir, I simply poured the quick gel slowly over the tarts, making sure to cover all the strawberries, so they had a nice glossy finish. 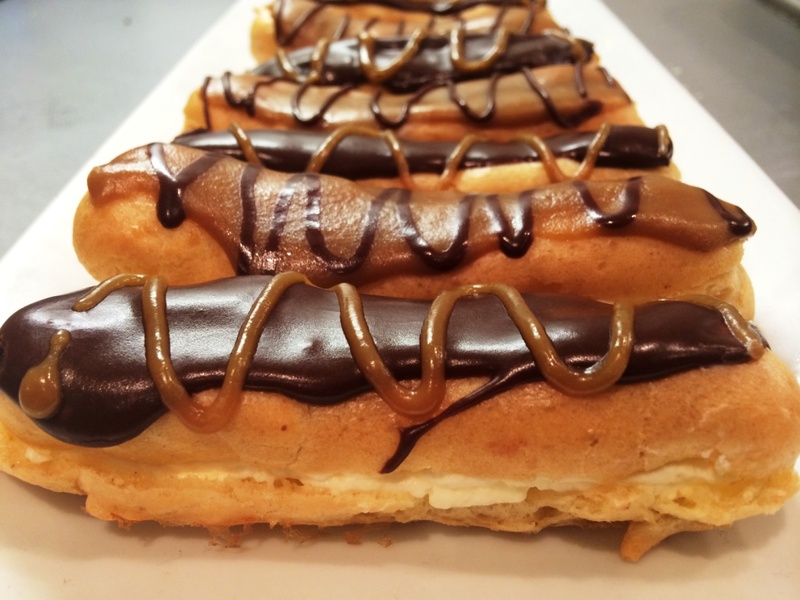 Refrigerate until you’re ready to eat (around 15 minutes minimum). 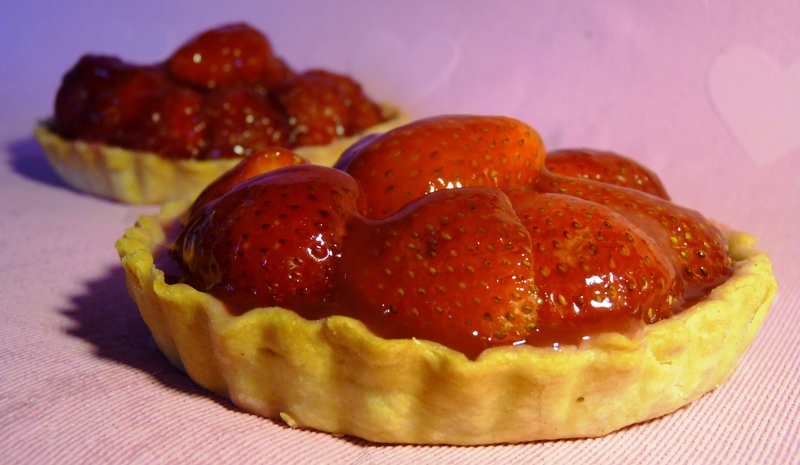 There were a few small offcuts of pastry which I used to make some jam tarts with fresh strawberries. 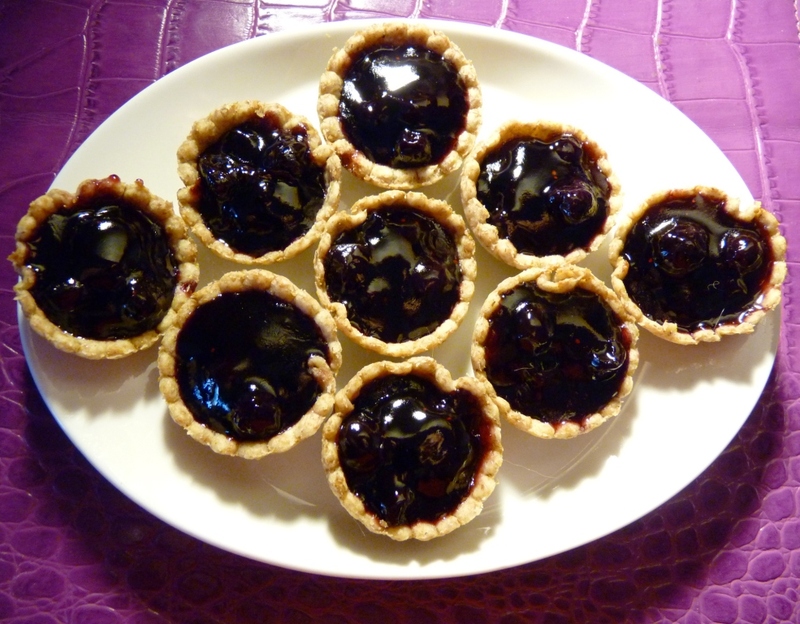 I rolled the pastry thinly into a rough circle shape, pressed it into a paper cupcake case, and added a good dollop of jam. 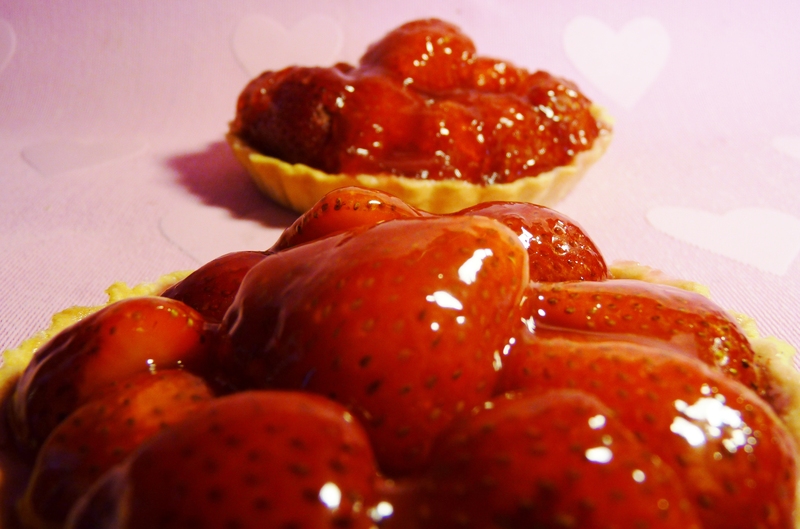 They baked for 12 minutes (slightly less than the bigger tart cases), and as soon as they came out I pressed half a strawberry into the melted jam. 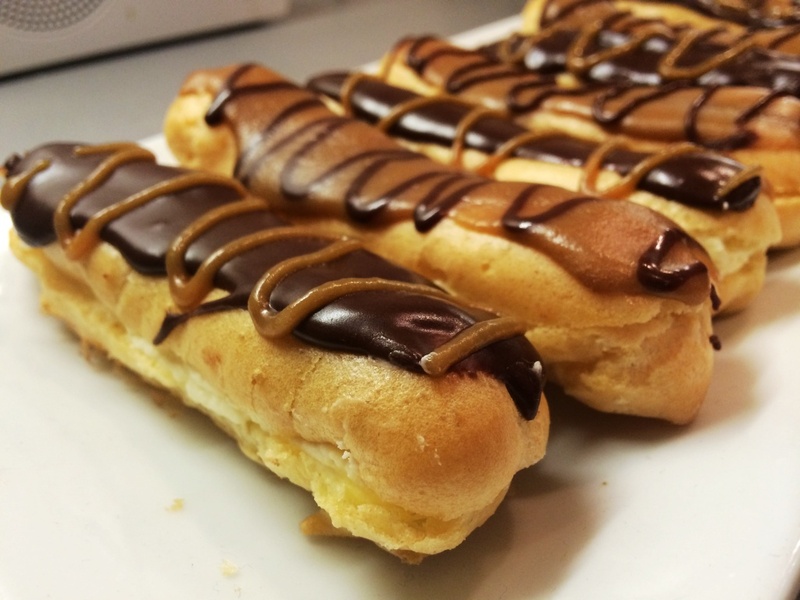 A couple of minutes in the fridge to cool, and they were ready for a quick afternoon snack!